CSX Intermodal on the Edge of Spring. 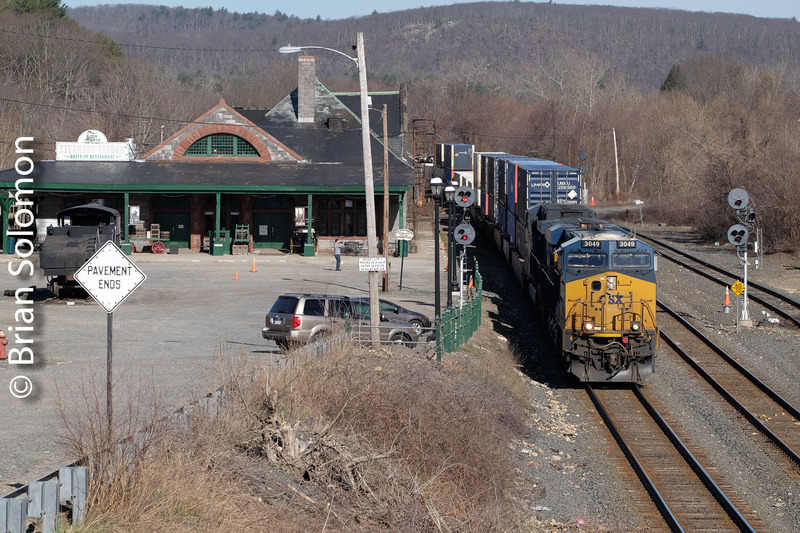 On my way through Palmer, Massachusetts, I noticed New England Central’s northward 608 blocked at the diamond crossing with CSX’s Boston Line. That was a good indication that a CSX train might be close. After a very short wait this eastward CSX intermodal train came into view. 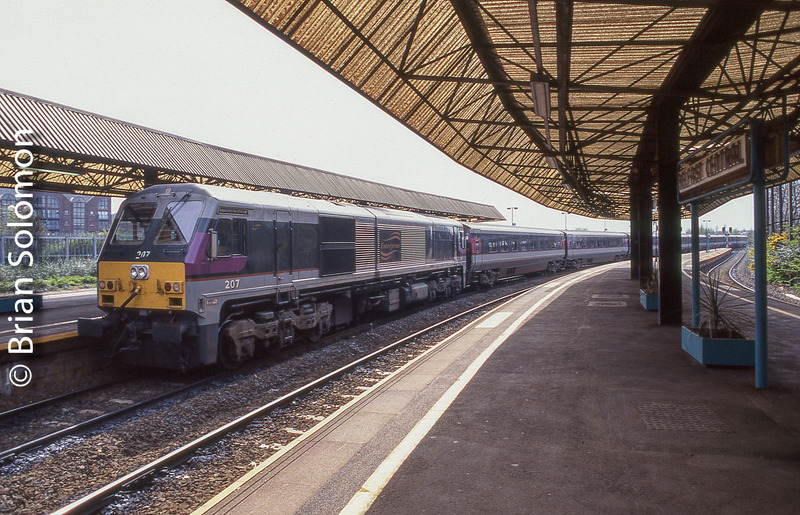 It was probably Q012;‑one of several daily trains that runs to Worcester for unloading. The trees are still bare, but the sun was bright. In just a few more days the trees will begin to leaf, the grass will become green, and Spring will be in the air. Exposed digitally with my FujiFilm X-T1 fitted with a 90mm Fujinon telephoto. I’ve composed the image to take in the old Union Station, now Palmer’s Steaming Tender restaurant, while positioning the lead locomotive between the control signals at CP83, and keeping the horizon in view. Mid morning light in Palmer, Massachusetts, April 2018. Rolling Along with 22K—Lesson in making Pacing Shots. 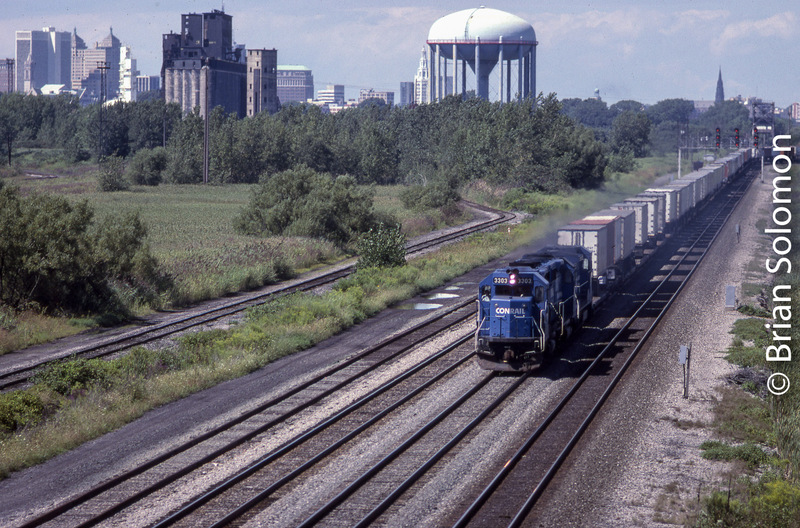 We were in hot pursuit of Pan Am Southern intermodal freight 22K with three BNSF Railway GE diesels in the lead. I rolled down the back window, set my Lumix to the smallest aperture (f8) and set the shutter speed dial to ‘A’ mode, which automatically picks the corresponding shutter speed based on the aperture setting. Since f8 lets the less light to the sensor, the camera program compensated by selecting a slow shutter speed. I exposed a burst of images as we drove along side the locomotives. Does it matter that we were in Shirley, Massachusetts? This is about location and something unusual. 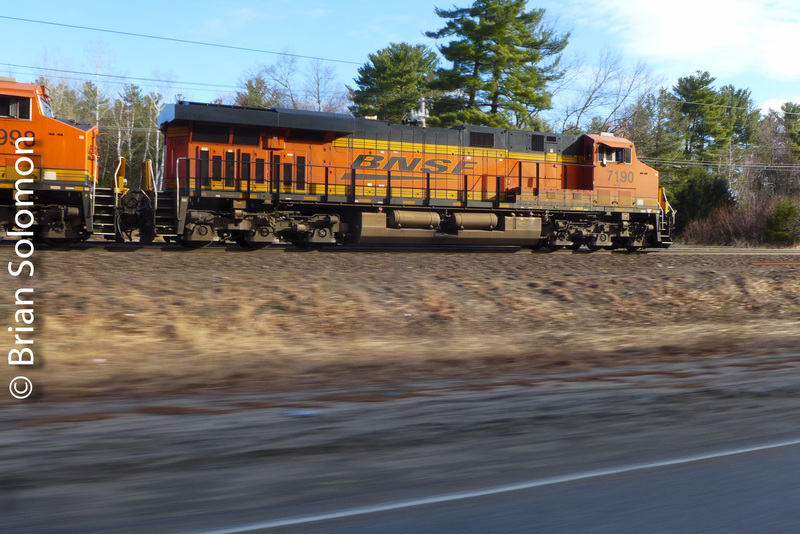 A week ago, Rich Reed, Paul Goewey and I were making a survey of Pan Am/MBTA operations around Fitchburg, Massachusetts, when we came across intermodal freight 22K stopped east of Fitchburg yard. 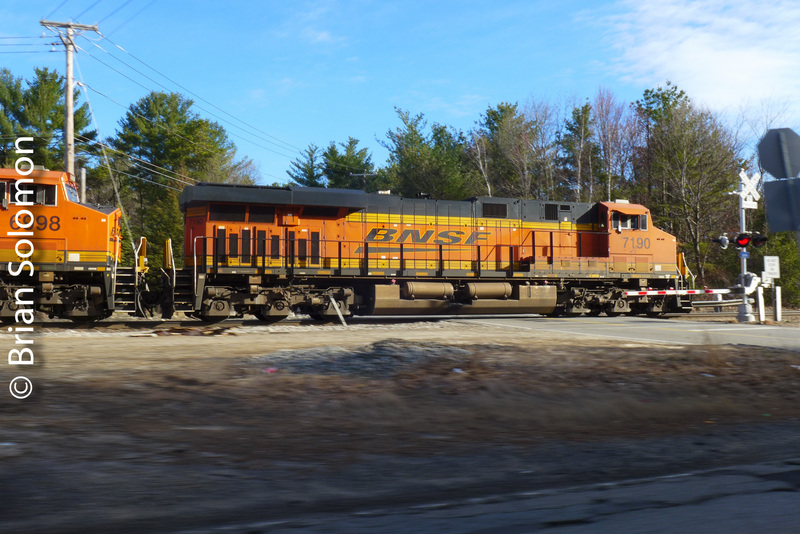 Driving up to the head-end, we were surprise to find that the train was led by three BNSF Railway GE diesels, with one of the ‘C4’ (model ES44C4; a six-axle/four-motor riding on a variation of the A1A truck) in the lead. 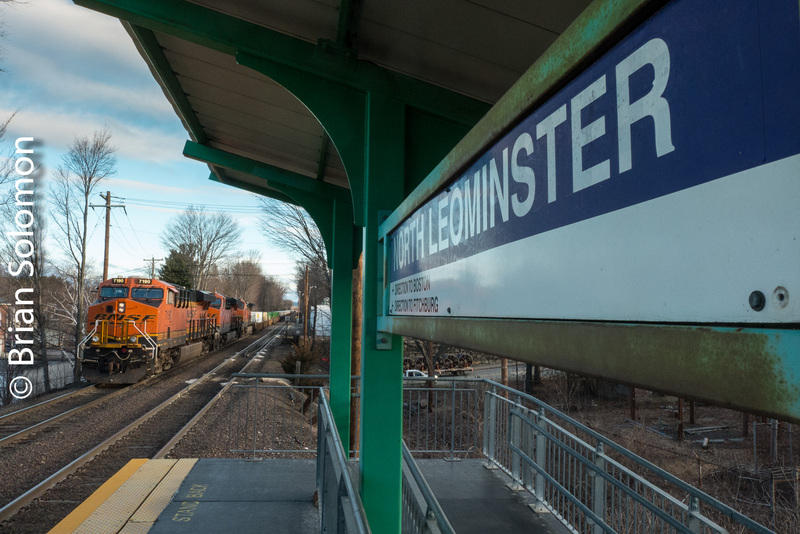 The train was stopped just west of MBTA’s North Leominster platforms to allow the morning commuter rush to pass unimpeded. This gave us ample opportunity to make photographs. 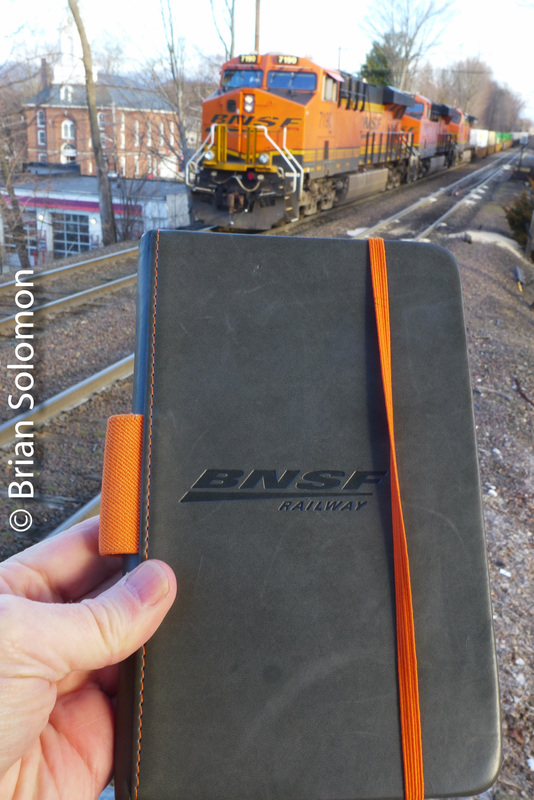 I was keen to show these BNSF locomotives (nearly 1,000 miles from home rails) operating in Boston suburban territory. Simply photographing the train/engines really wasn’t good enough, since without some geographically identifying feature, these images could be anywhere. While I made some close photos of the engines for the record, but I also made a point of exposing images that included station signs and other features to positively identify where we were. 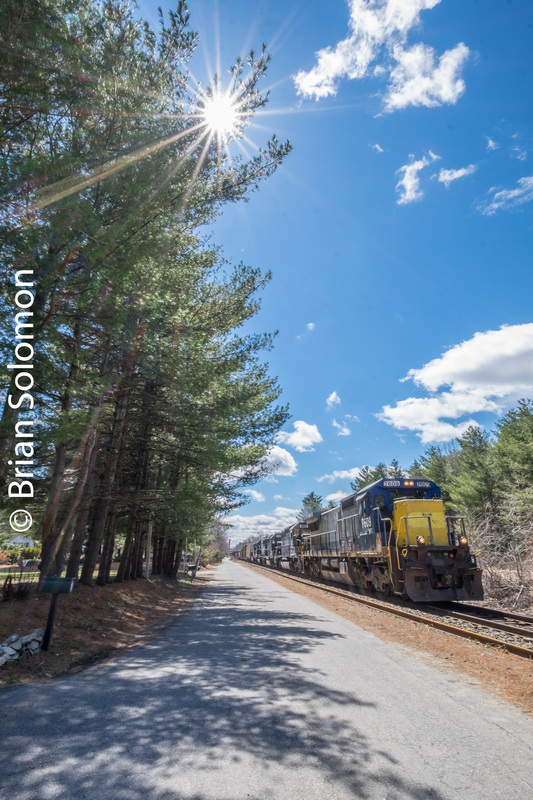 Morning sun on Pan Am Southern intermodal freight 22K at North Leominster on April 20, 2018. 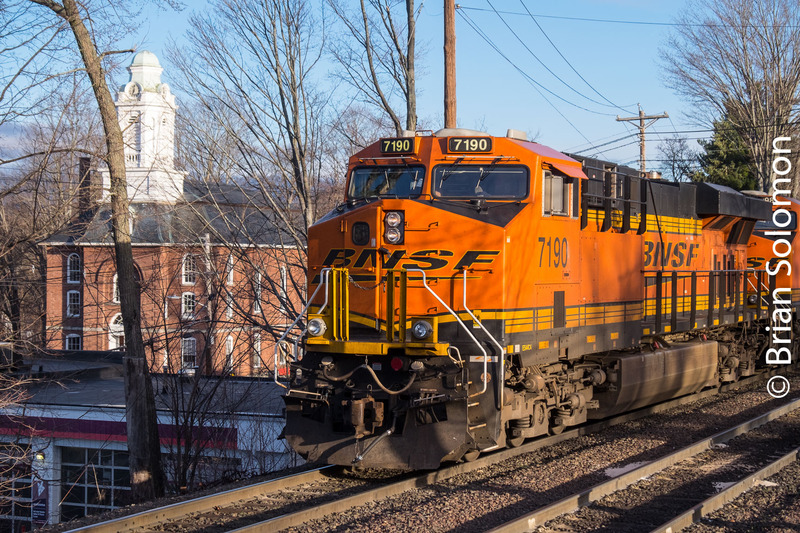 The big GE diesels weren’t the only thing displaying the BNSF logo in North Leominster! Not the most graceful composition, but it shows where we are. MBTA 406 heading to Boston’s North Station overtakes 22K at North Leominster. 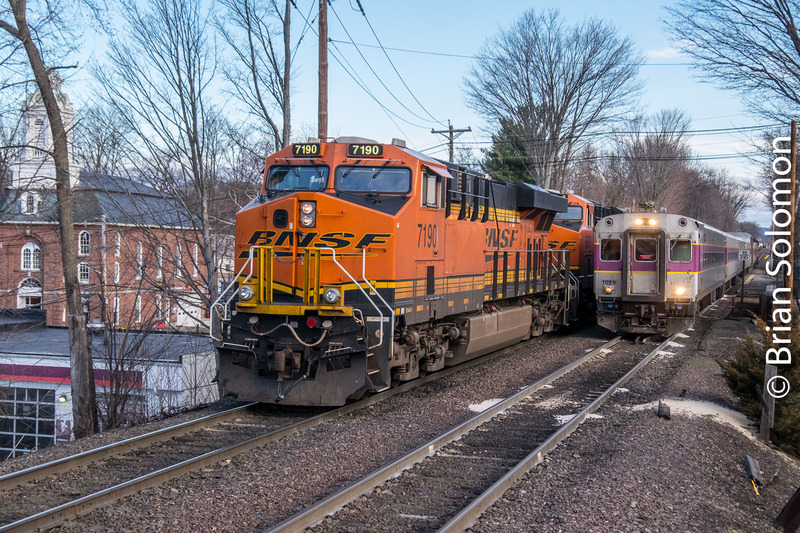 As MBTA 406 accelerated away from the station, I made a photo of the trailing locomotive with the BNSF GEs beyond. 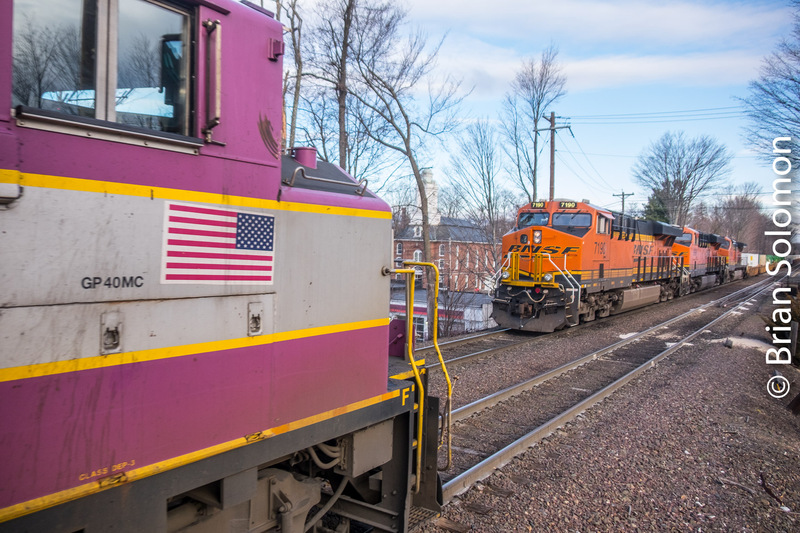 MBTA operates its trains in push-pull mode (locomotive only at one end, cab control car at the other). One the commuter rush cleared, 22K got permission to proceed and continued east toward its terminus at Ayer, Massachusetts, leading to more photographic opportunities. Stay tuned! Admittedly not the most scenic location, but this view from the North Leominster parking garage identifies where we are. When a Rainy Day allows for a Better Photograph. Here’s an example of when a rainy day allows for a better photograph. 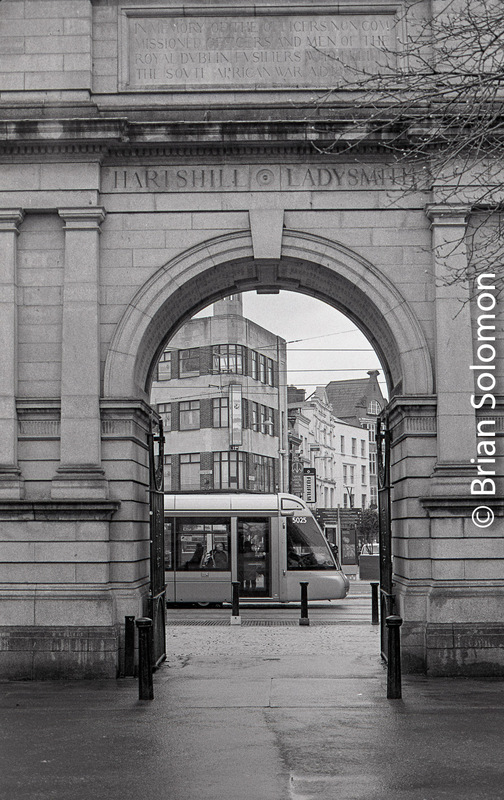 Dublin’s recently extended LUAS Green Line passes the famous Fusilier’s Arch entrance to St. Stephen’s Green. While the popularity of the park on nice days results in a continuous procession of people in and out of the park, making it difficult to frame up a tram beneath the arch. Simply getting an unobstructed view can be problematic. Exposed on Kodak Tri-X with a Nikon F3 with 50mm lens. Certainly you can make some kind of photo here on a bright day, but it will look pretty different than this classical view. Two Years Ago I Traveled by TGV from Brussels to Bordeaux. 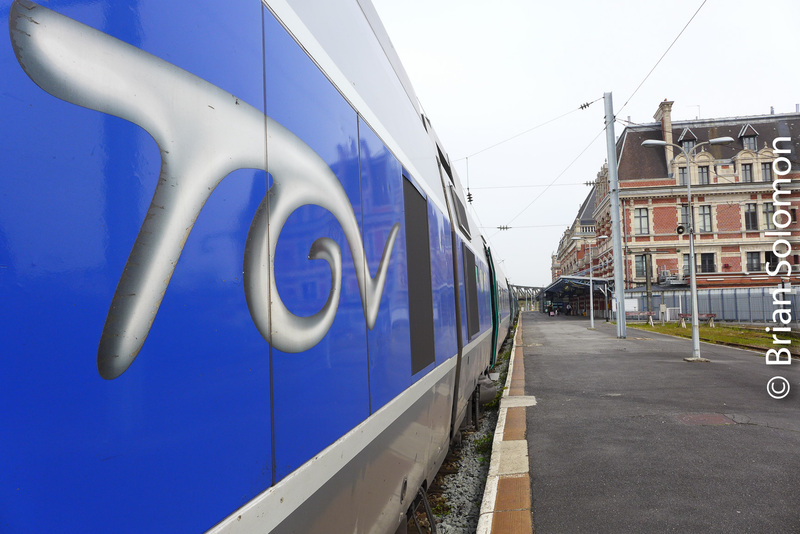 SNCF’s magnificently engineered high-speed railways lines (known as the LGV) permit its TGV high-speed trains to reach speeds of approximately 200 mph on select portions of the network. On 26 April 2016, I traveled from Brussels to Paris Charles de Gaulle Airport where I met my father who was arriving from Iceland, and we continued by train to Bordeaux. This was part of a three-week railway adventure across central Europe. I made these views with my Lumix LX7. 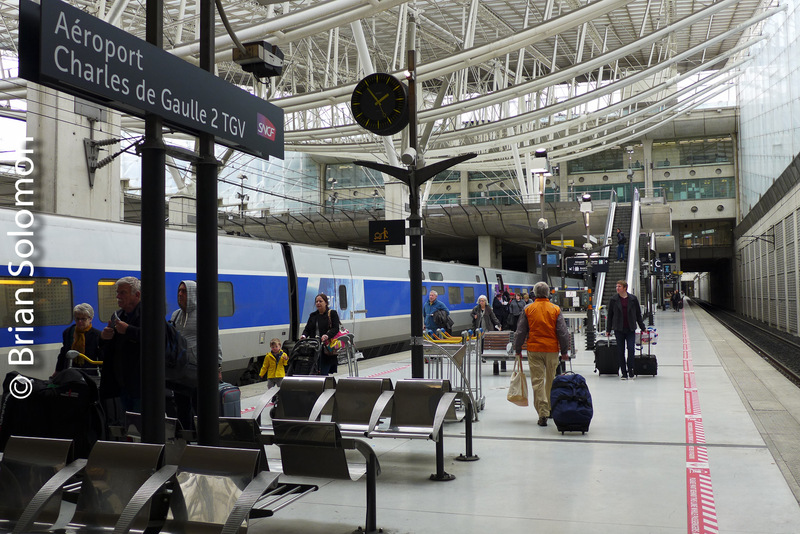 SNCF’s Charles de Gaulle Airport Station offers excellent airline-train connections. 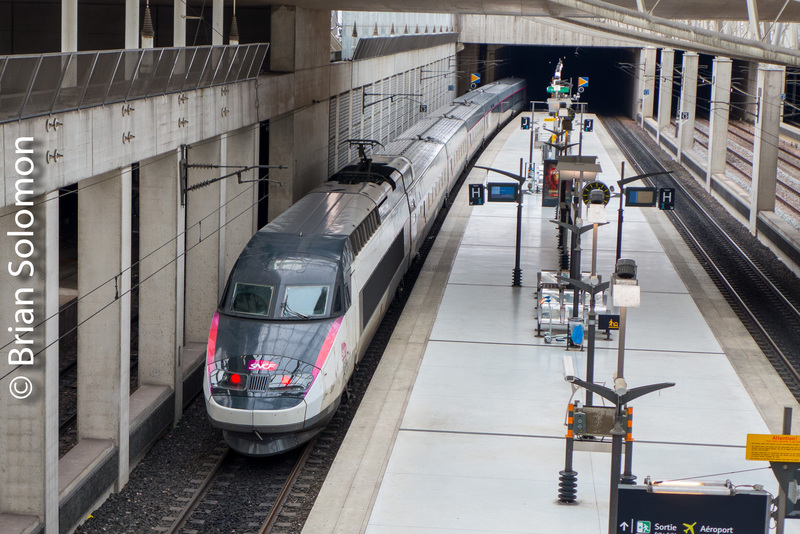 A Switzerland-bound TGV Lyria at Charles de Gaulle Airport Station. 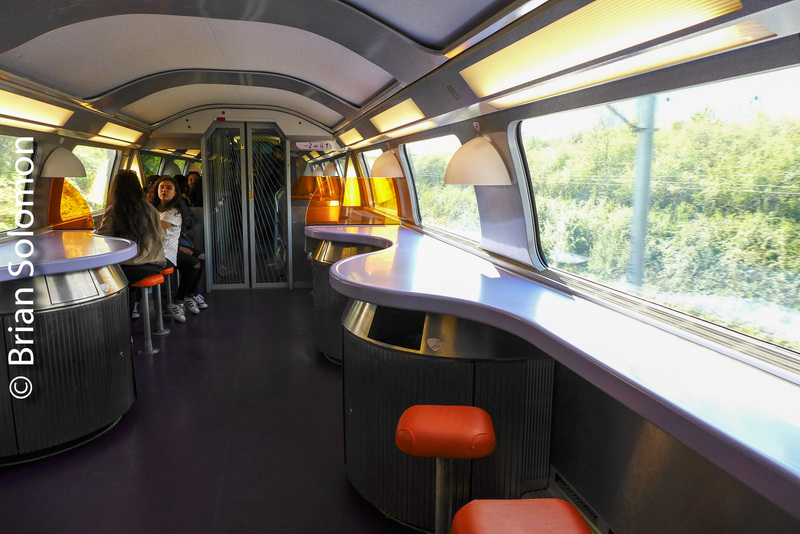 Lounge/bar on the TGV where you can enjoy a beer or glass of wine at nearly 200 mph. 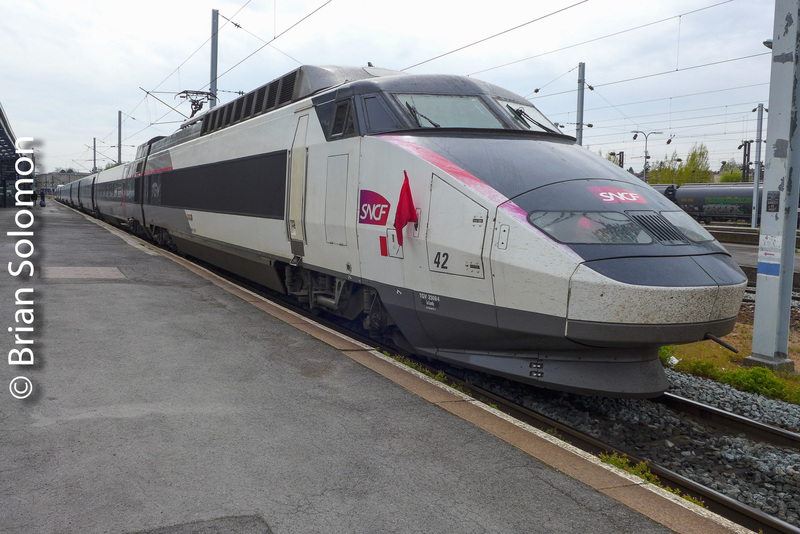 SNCF’s TGVs are among the high speed trains featured in my new Railway Guide to Europe published by Kalmbach Publishing. 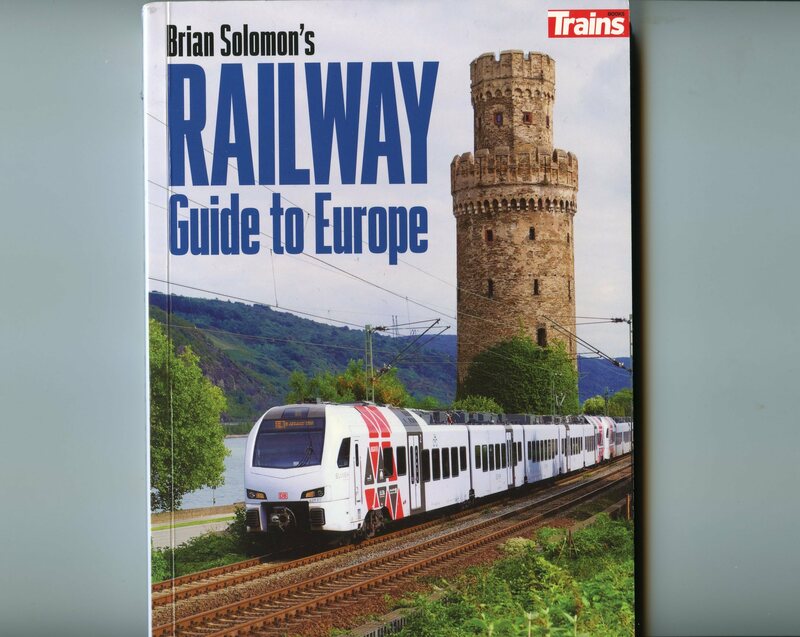 Click here to order Brian Solomon’s Railway Guide to Europe. My new guide book on European Railway Travel is out now. Get yours today. 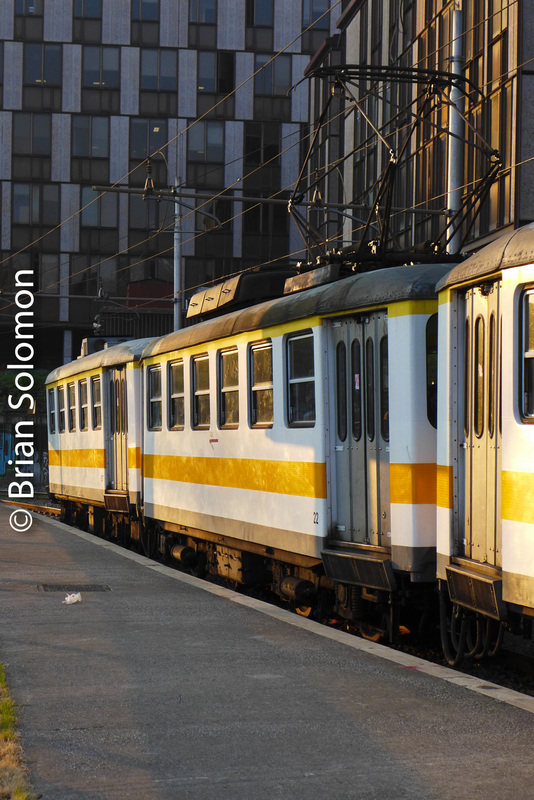 I Visited SNCB’s Antwerp Central Station on this day in 2016. It was on this day, 25 April 2016, almost, 20 years after my first visit to Antwerp Central, I made the opportunity to revisit this amazing European railway palace. SNCB’s (Belgian National Railway) Antwerp Central had been completely transformed since my 1996 visit (while traveling from Brussels to Amsterdam with my dad). It now features tracks on three levels, including a through line at the lowest level. 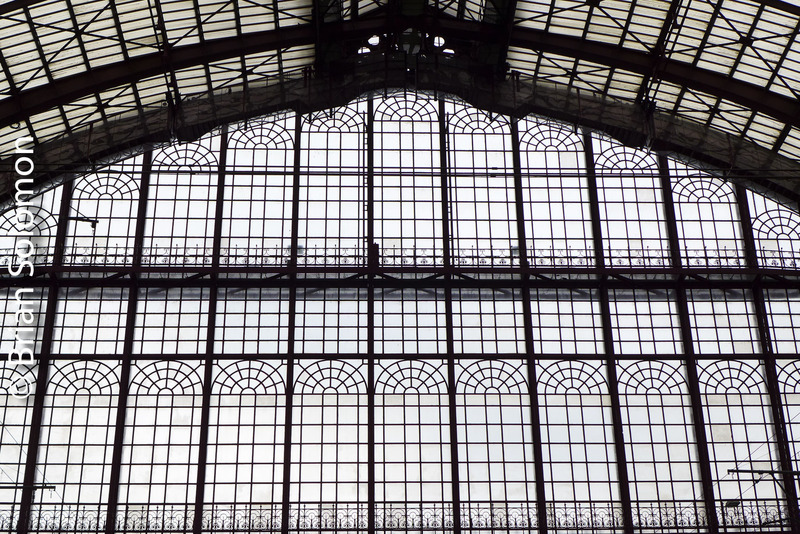 Steel and glass train shed at Antwerp Central Station on 25 April 2016. Lumix LX7 photo. Lowest level of Antwerp Central. 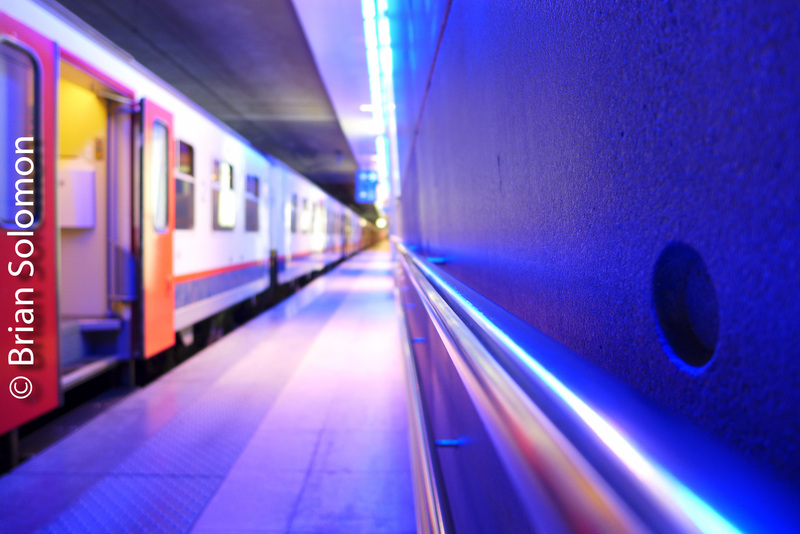 A through Amsterdam to Brussels train arrives on the lowest of three levels. Photo adjusted in Lightroom to compensate for contrast and colour saturation. 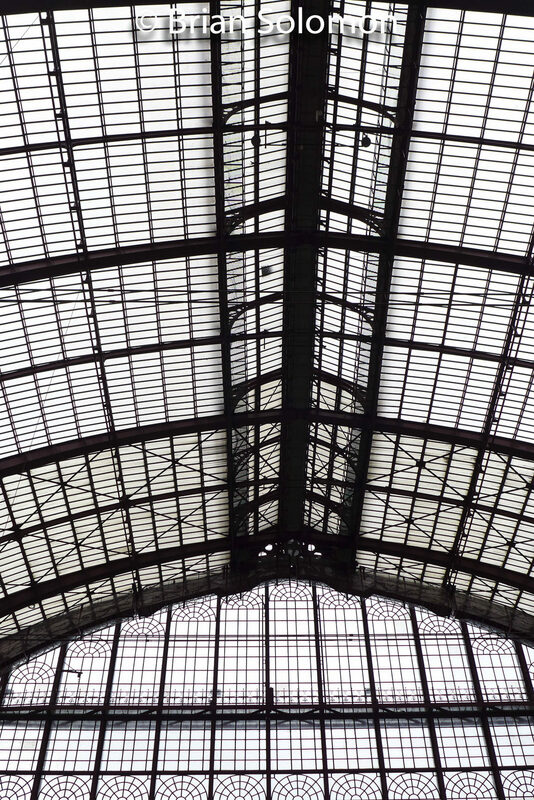 In my railway travels across Belgium, I’ve photographed at Antwerp Central on a half dozen occasions over the years, and the station remains one of my favorite. 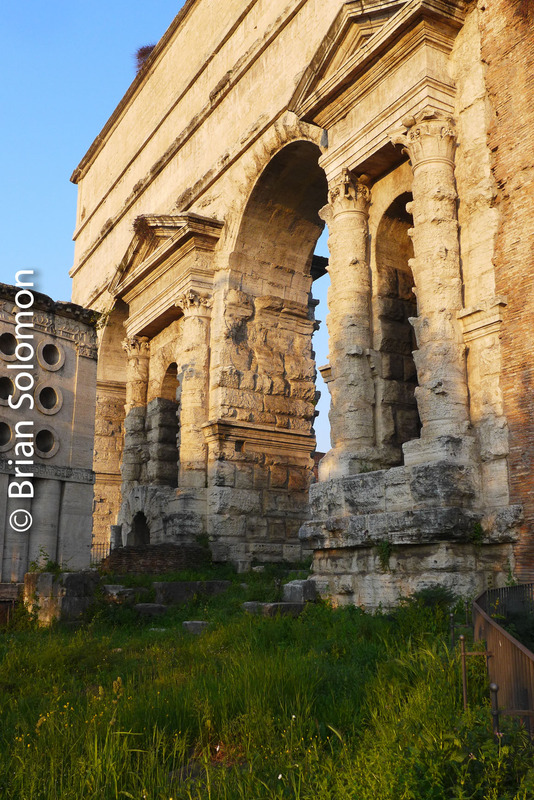 These photographs were exposed digitally with my Lumix LX7, which is an ideal tool for making urban images. Antwerp is among the cities featured in my new Railway Guide to Europe published by Kalmbach Publishing. Pan Am EDPO out of the sun—Lessons in Lightening Shadows. There used to be a philosophy discouraging photographers from shooting into the sun. Some types of older equipment (without decent flare control systems) tended not to produce appealing photos when looking toward the sun, while many films didn’t have adequate dynamic range for capturing the contrast range from direct sun to inky shadows. I’ve found that by using a very wide lens, with a tiny aperture setting, I can get some interesting and satisfactory results by looking directly into midday sun. Years ago, I’d accomplished this with my Leica and a 21mm Super Angulon on black & white negative film (Kodak Panatomic-X ISO 32 was a good choice). In more recent times, I use my FujiFilm X-T1 digital camera fitted with a Zeiss 12mm Tuoit, set at its smallest aperture (f22), which leads to the starburst effect as result of diffraction from the very small polygon opening. I work in RAW, and then digitally manipulate the files in post processing using Lightroom. Specifically, I uniformly lighten the shadow areas to partially compensate for the extremely contrasty setting. It helps to partially block the sun, as in this image near Forge Village in Westford, Massachusetts. Pan Am Railways EDPO (East Deerfield to Portland) works the old Stonybrook Line at Forge Village. Exposed with a my FujiFilm X-T1 digital camera fitted with a Zeiss 12mm Tuoit; 1/30thof a second at f22, ISO 200. Tracking the Light Posts New Photos Daily! 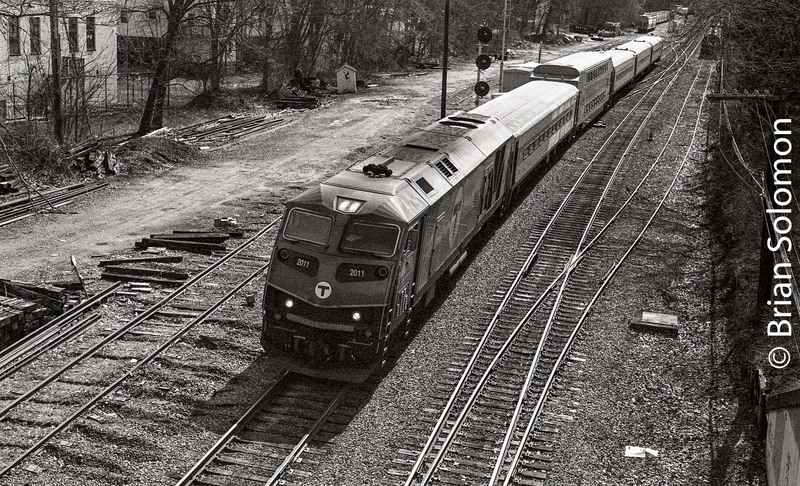 One of MBTA’s HSP-46 diesels leads a mid-morning westward commuter train approaching its station stop in Ayer. Making effective Midday backlit shots requires challenging photographic techniques. In this instance, I took an elevated view, slightly over exposed Kodak Tri-X to allow for greater shadow detail while completely cropping the sky to avoid the visual distraction from excessive highlight brightness. Image exposed on Kodak Tri-X black & white film using a Nikon F3 with f1.4 50mm lens and custom processed to allow for maximum tonality. Processing the film was my key for achieving better balance and rich tonality. Working with Ilford ID-11, I used a 1 to 1 mix with water and lowered the recommended process time for Tri-X from 11 minutes to 7 minutes 45 seconds (at 68.5 degrees F). This lowered the contrast and prevented excessive processing in the highlight areas. After processing, I toned the negatives with a selenium solution, which give the highlights a slight silvery snap, just enough to make for richer tonality without blowing out all the detail. My goal was to make the most of the reflections off the rails and the top of the train. Tracking the Light Posts something new every day! In the Shadow of the Jungfrau—One Year Ago Today! 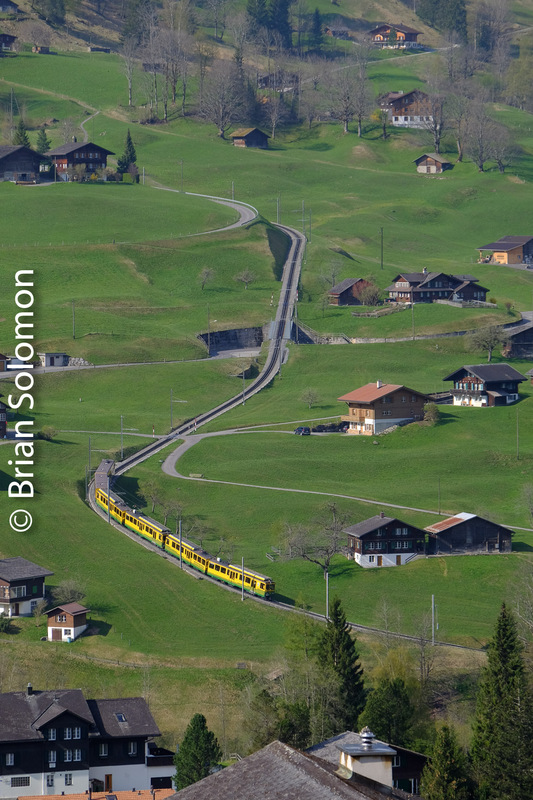 On this day (23 April) 2017, I was photographing at Grindelwald, Switzerland while researching my Railway Guide to Europe. (Just published by Kalmbach Books). I made these views from the station platform at Grindelwald, where the Bernese Oberland Bahn (BOB) meets the Wengernalpbahn. The Wengernalpbahn drops into the valley toward Grindelwald Grund, where the line reverses for the steep rack-aided ascent toward Kleine Scheidegg. Exposed using a FujiFilm X-T1 with 18-135mm zoom lens. Bright morning sun made for perfect lighting on this dramatic mountain scene. Exposed using a FujiFilm X-T1 with 18-135mm zoom lens. 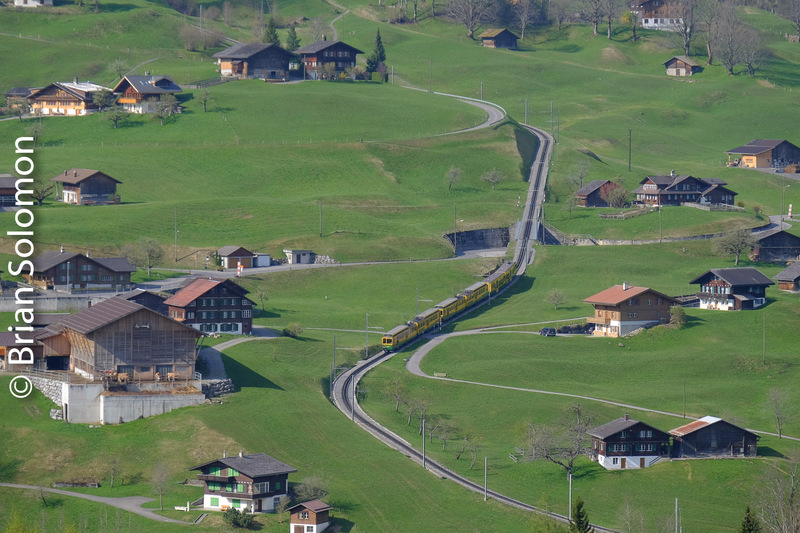 A Wengernalpbahn train descends toward Grund. This was among the many lines Denis McCabe and I photographed in Switzerland that week. 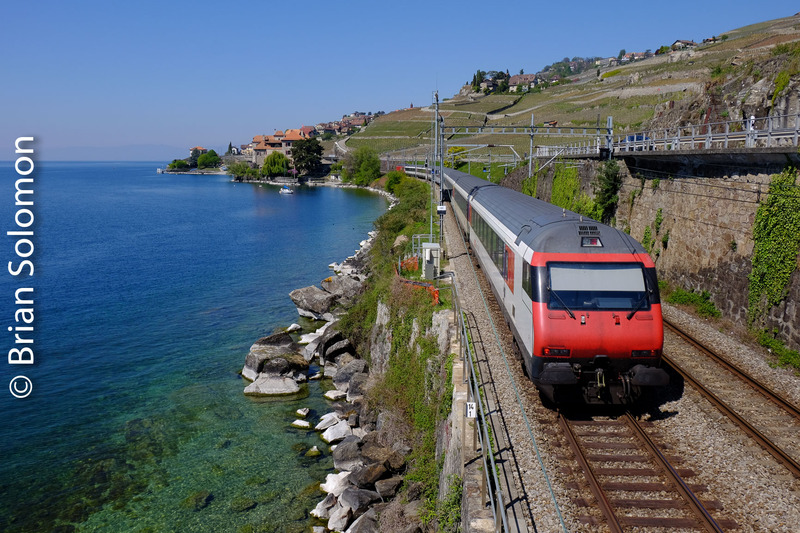 In my book, I offer a variety of useful and practical advice for traveling European railways, while highlighting scenic journeys, interesting routes, and some of Europe’s most interesting cities and towns. The book compiles more than 20 years of European travel in to just over 400 pages. 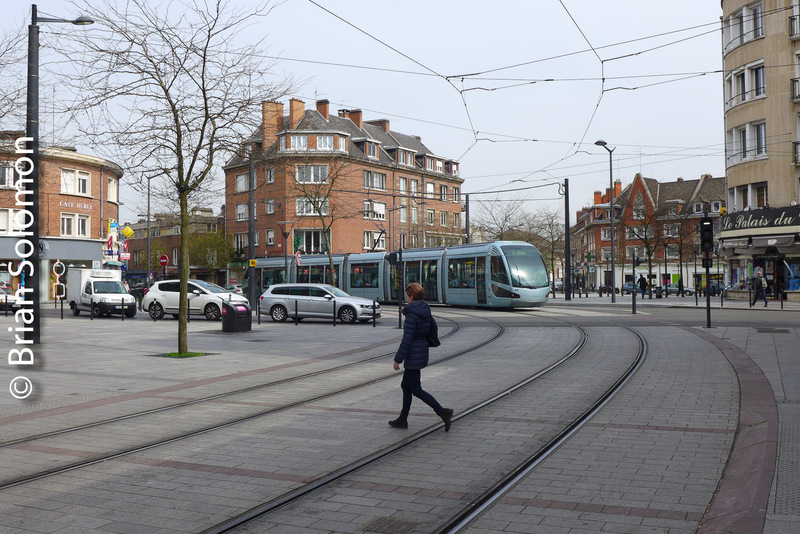 Modern Alstom Trams in an Old French City; Valenciennes—22 April 2016 Part 2. As a follow up to this morning’s post on SNCF at Valenciennes, I thought I’d post a few Lumix LX7 photos I made of the city’s modern tram system. 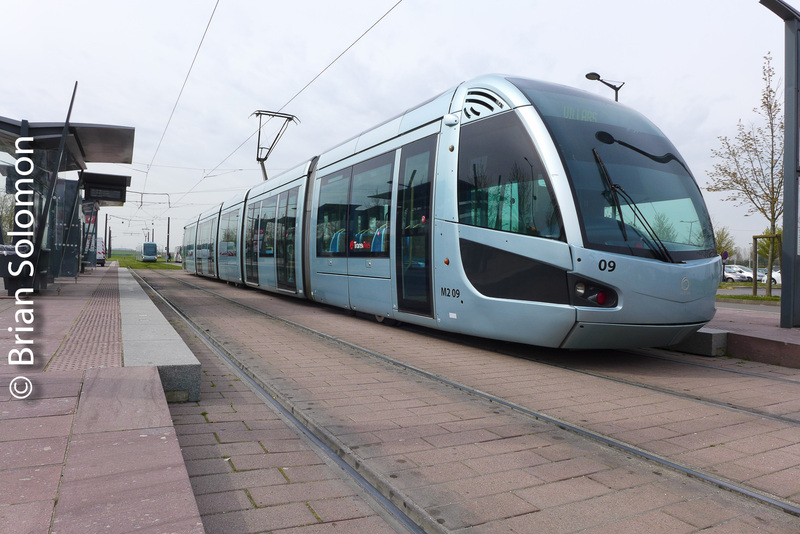 This is a show-case system of Alstom’s tram technology and features street running, trackage in grass-covered central medians, and tram lines on old SNCF railway lines. 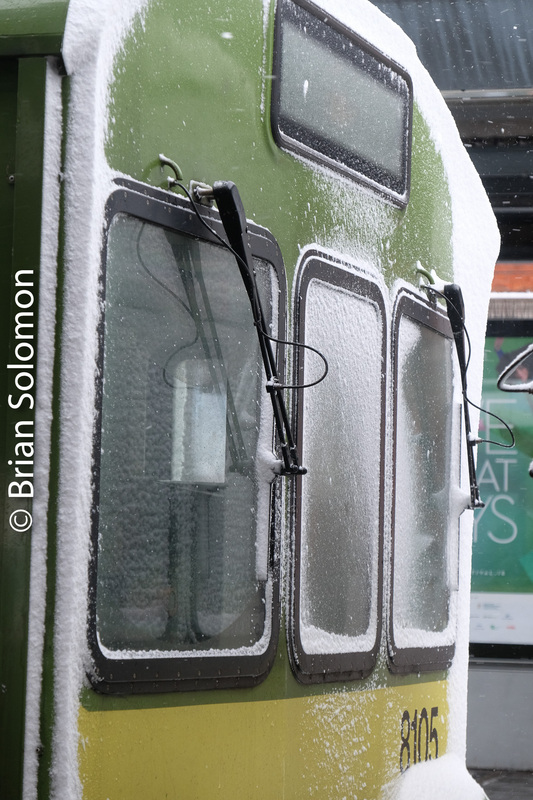 The Citadis trams are very similar to those employed on Dublin’s LUAS network, albeit with different styling. The day started out with pale thin sunlight, which was gradually replaced by a even dull overcast. Valenciennes on 22 April 2016; Lumix LX7 photo, unaltered JPG image (except for scaling). 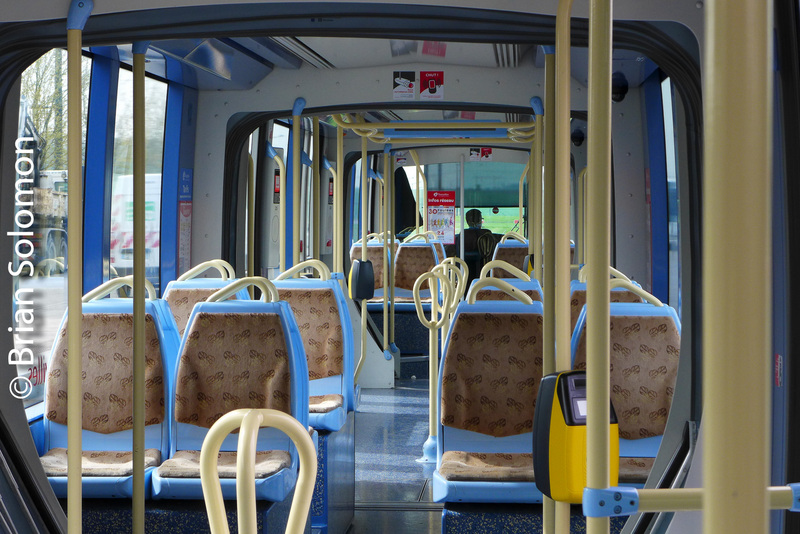 Valenciennes tram on 22 April 2016; Lumix LX7 photo, unaltered JPG image (except for scaling). Valenciennes on 22 April 2016; Lumix LX7 photo, adjusted RAW file, with contrast, exposure and saturation altered to improve balance and interest. LX7 photo. 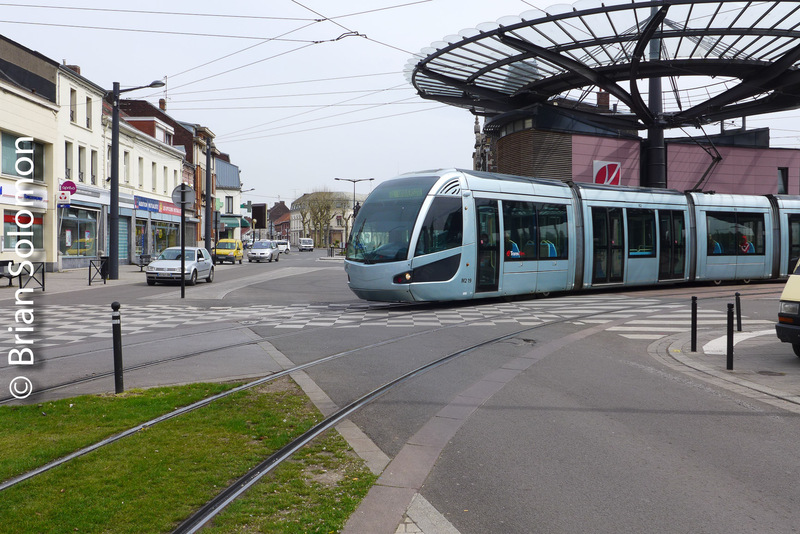 Espace Villars terminus on the Valenciennes tram system. Tracking the Light posts Daily and sometimes twice! On this Day in 2016; Valenciennes, France. On this Day in 2016, I visited Valenciennes, France. It was two years ago today (22 April, 2018), that I made my second visit to Valenciennes, France. Although it was dull, I worked with my Lumix to make these views of SNCF’s TGV high-speed sets at the Valenciennes former Nord railway station. Not every day is bright and sunny; not every city is blessed with world-class wonders; and not every high-speed train is moving fast. 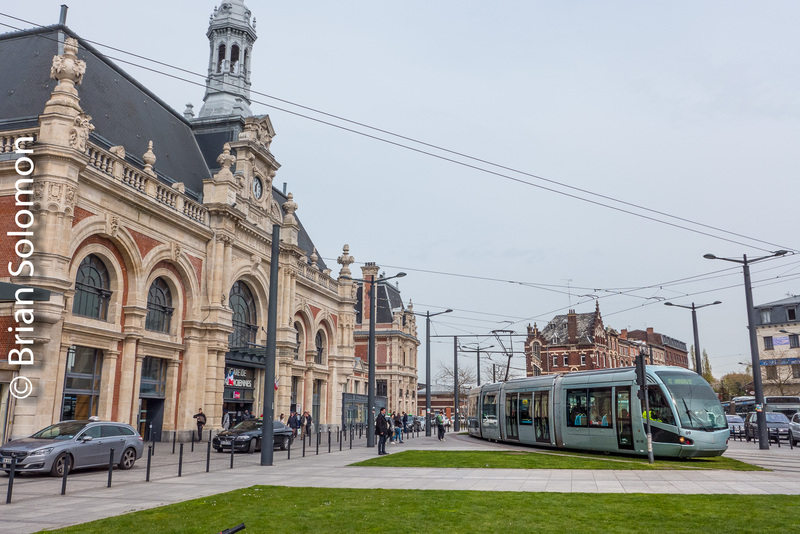 Valenciennes has a nice old station and a showcase small-city modern tram system. Later in the day, I caught up with my Finnish friend Mauno Pajunen, and toured Belgian railway sites in the region. 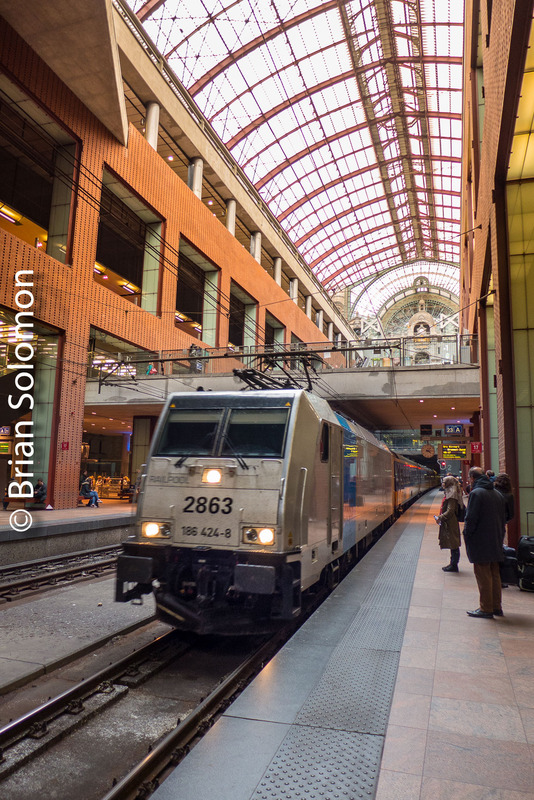 Over the next few days , I made a high-speed railway journey to Bordeaux and and then through the Channel Tunnel to London—all part of my exploration that contributed to the content of my latest book; Brian Solomon’s Railway Guide to Europe. 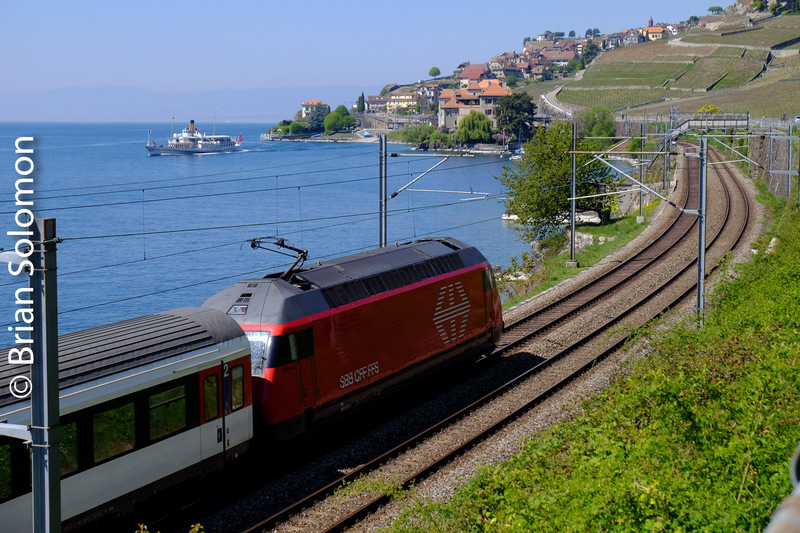 One Year Ago: SBB on a Clear April Morning Along Lake Geneva. I made these photos on 21 April 2017 along the shore of Switzerland’s Lake Geneva near St. Saphorin. 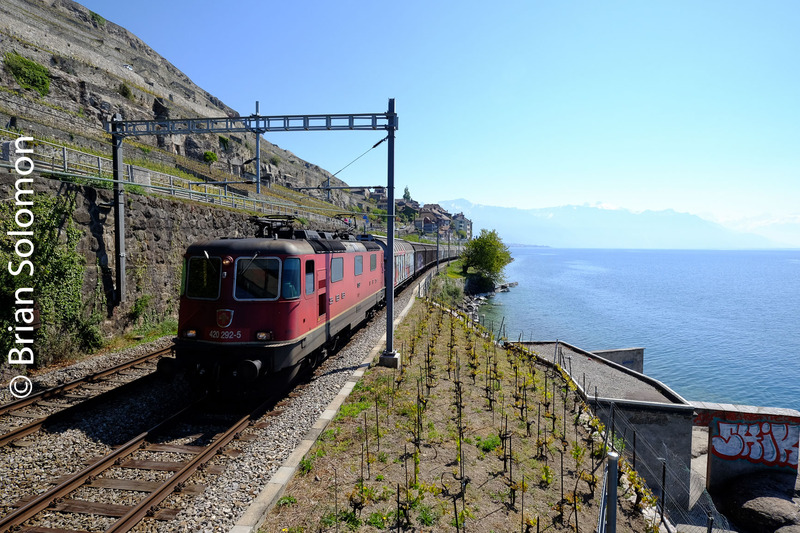 SBB’s busy double track electrified line and stunning Swiss scenery with bright sun was a winning combination for great photographs. This was one stop on a week-long exploration of Swiss railways with Denis McCabe while I was preparing my Railway Guide to Europe. Exposed using a FujiFilm XT1 digital camera on 21 April 2018. SBB freight. Exposed using a FujiFilm XT1 digital camera on 21 April 2018. 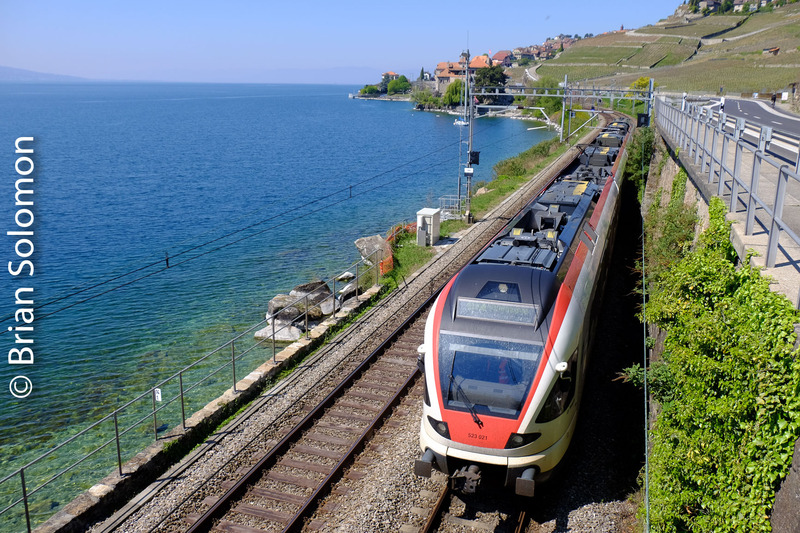 Switzerland’s Lake Geneva region is one of many scenic areas profiled in my new book on European railways published by Kalmbach Publishing this Spring. 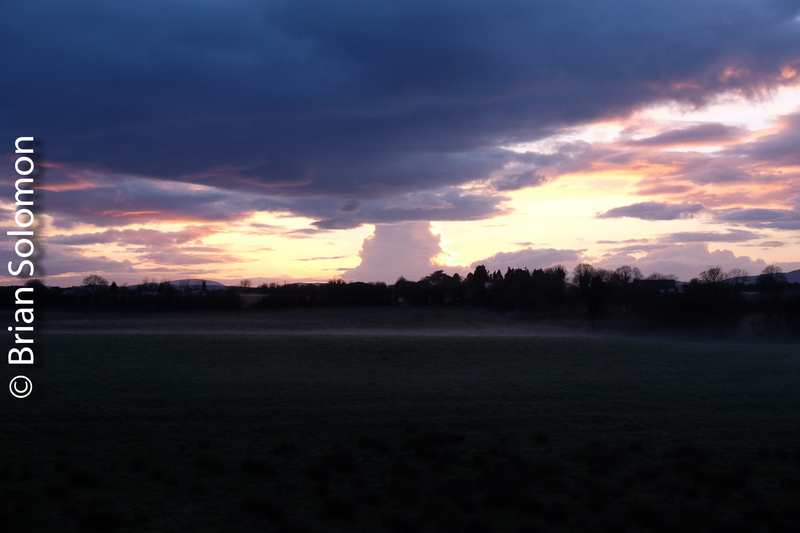 Sun and Cloud, The RPSI Cravens at Claude Road: A Lesson In Patience. 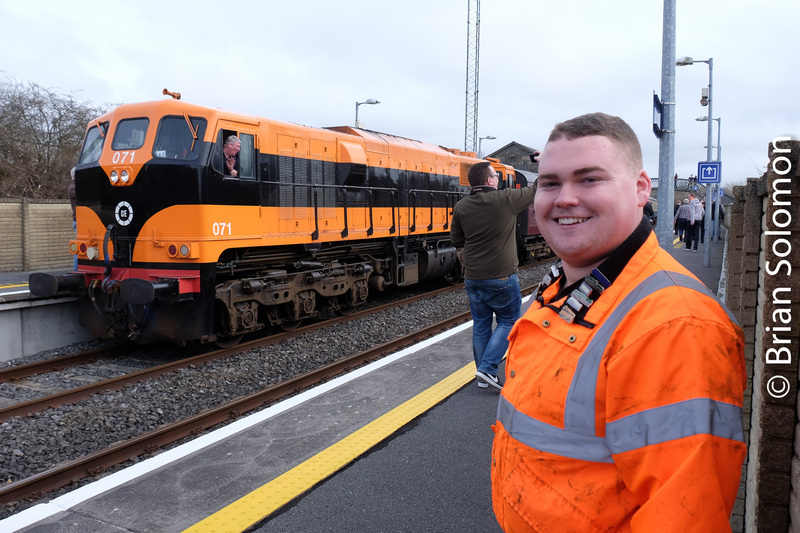 On Satuday 24 March 2018, I shared Dublin’s Claude Road foot-bridge with Paul Maguire and Ciarán Cooney, as we waited for the RPSI Cravens to run from Inchicore to Connolly for a scheduled inspection of the equipment. 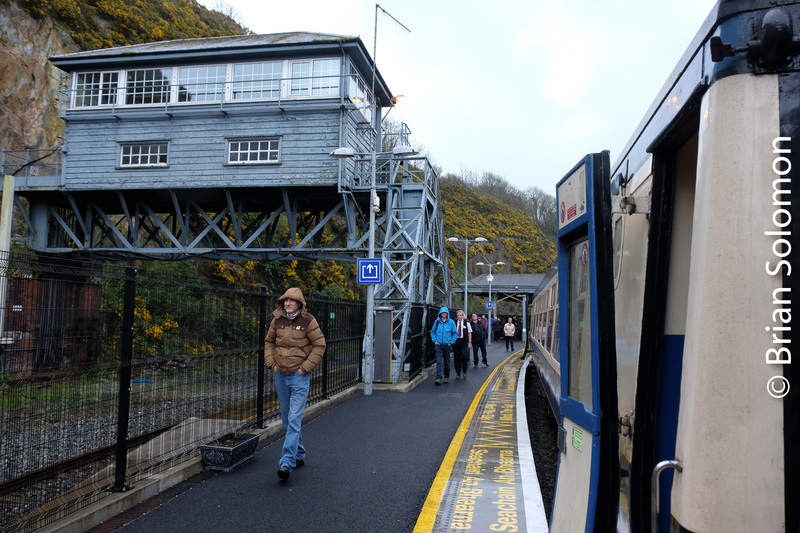 It had been completely sunny, but as the time for the train approached, clouds began to dapple the morning sky. I exposed this view using a Nikon N90S with 180mm Nikkor telephoto lens on Fujichrome Provia100F slide film. The light was in flux when I released the shutter. Was the train in sun? I had to wait more than three weeks to find out, since I’ve just received my slides back from the lab. 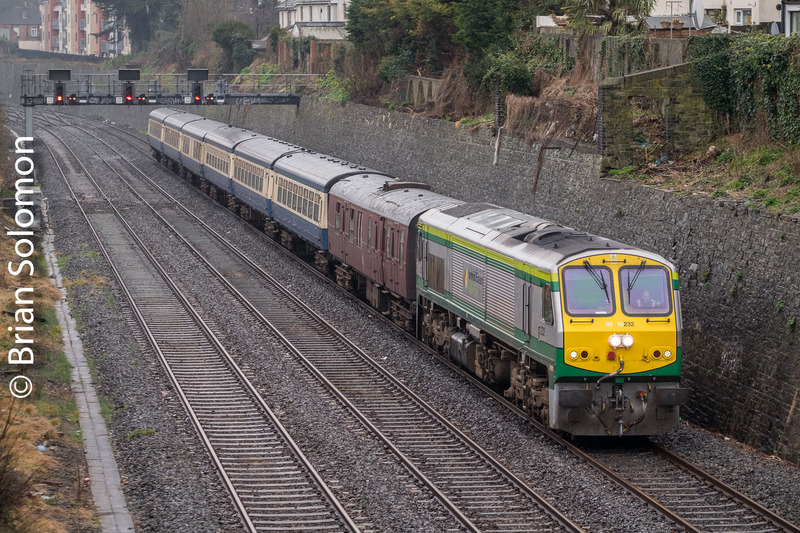 Irish Rail 084 leads the RPSI Cravens eastward at Claude Road. File adjusted with Lightroom. I made some nominal adjustments to contrast and colour balance after scanning. 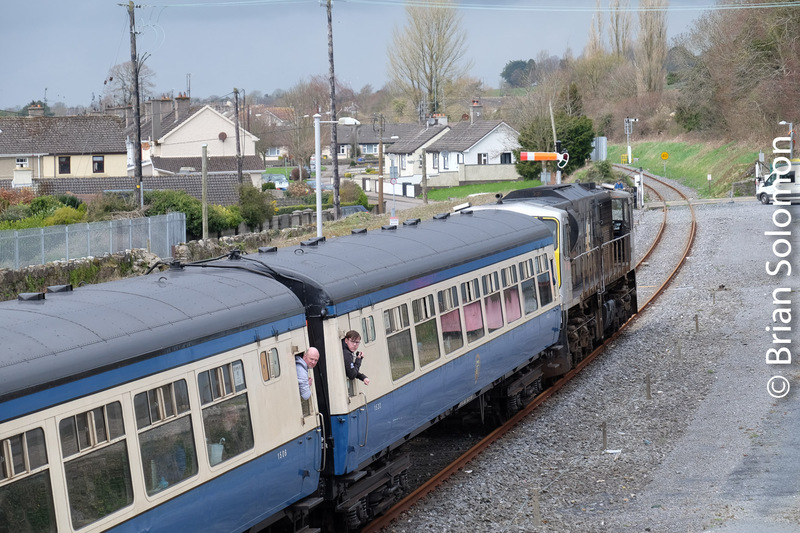 I feature Irish Rail and the Railway Preservation Society of Ireland in my new Railway Guide to Europe, which is now available from Kalmbach Books. 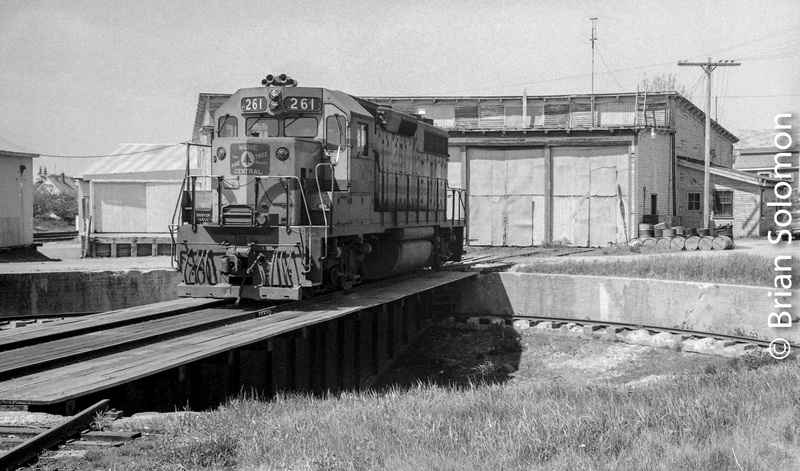 Maine Central’s Rockland, Maine Roundhouse—August 1980. I was just a kid with a camera. Luckily, the camera was a Leica 3A. I’d loaded it with Tri-X and exposed a few views around the Rockland, Maine roundhouse during a visit there with my family in August 1980. Months later I processed the film in Microdol-X (not the best choice of developers, but it’s what I used at the time) and made a few tiny prints. Then I put the negatives in a paper envelope and mostly forgot about them. Rockland, Maine in August 1980. Two years ago, when looking for some other photos, I re-discovered the negatives in a big batch of missing photos, and scanned them at high-resolution with an Epson flatbed scanner. This photo required a little post processing adjustment to improve tonality and even out contrast, while removing a few dust specs. 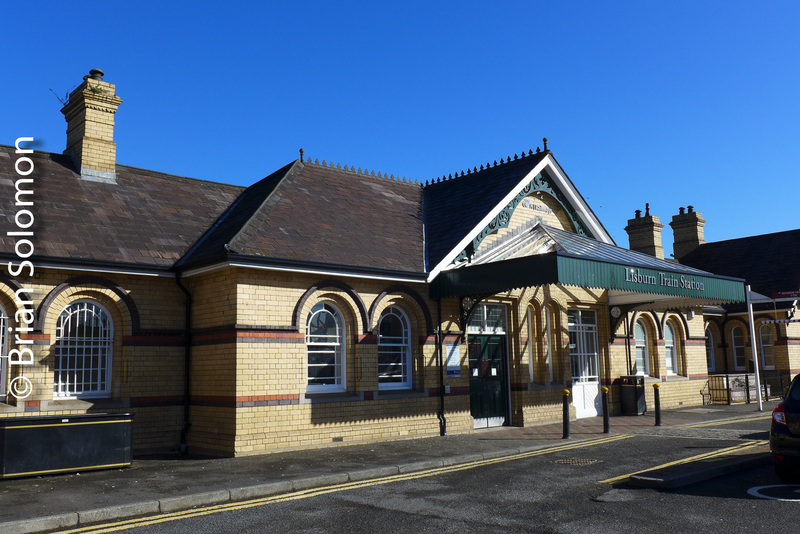 Lisburn Station on a Sunny Morning. It was nearly two weeks ago that I exposed these views on a clear cold morning at NI Railway’s Lisburn Station. There’s nothing like a polarized sky and low sun. The photos almost make themselves. These were exposed using my Lumix LX7. Soon afterward I was rolling along toward Portadown. A clear blue dome; great conditions for photograph. 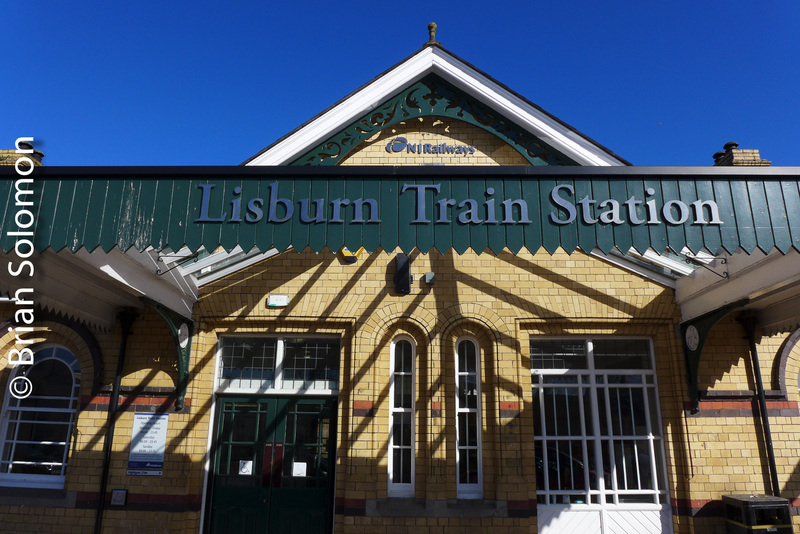 Lisburn Station is among the best preserved former Great Northern Railway stations. 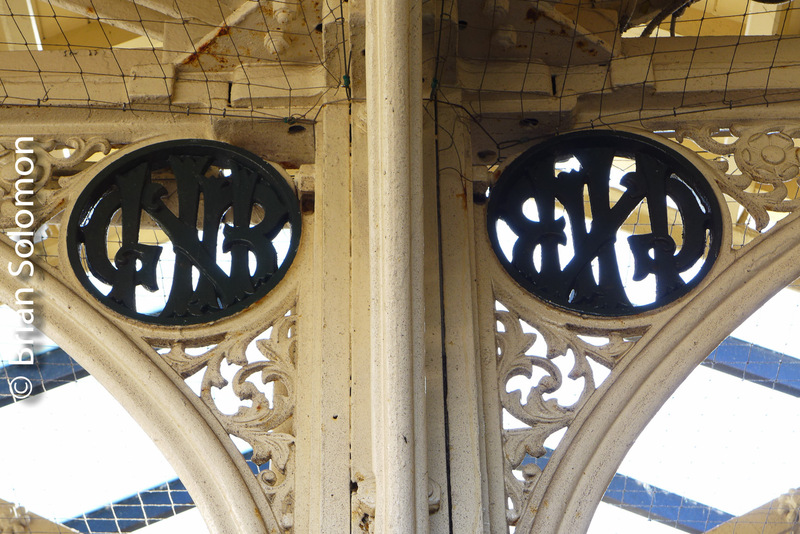 GNR’s heralds are still in place on the canopy supports. 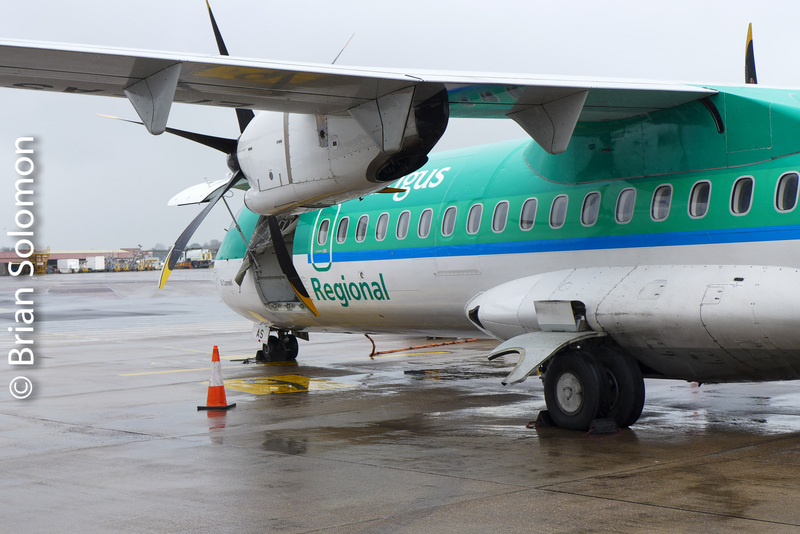 Belfast-Dublin Enterprise at City Hospital—4 Views. 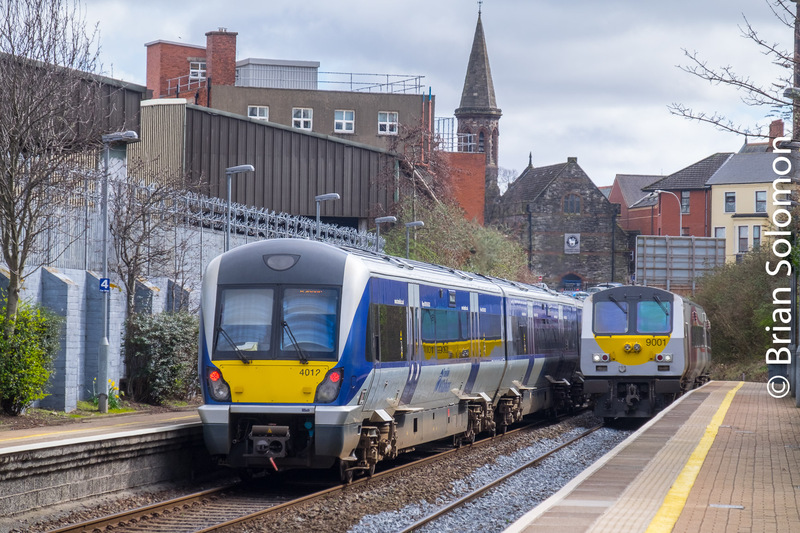 On two occasions on 27 March 2018, I made sequences of the Belfast-Dublin Enterprisepassing NI Railway’s City Hospital station. 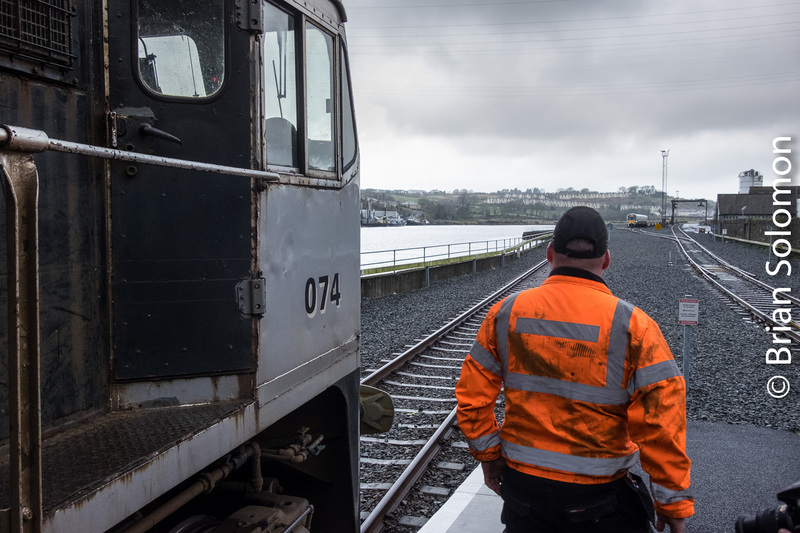 The Enterpriseservice typically consists of a push-pull De Dietrich sets with a General Motors built 201-class diesel at the Belfast end. These views were exposed using my FujiFilm XT1 with 18-135mm lens. 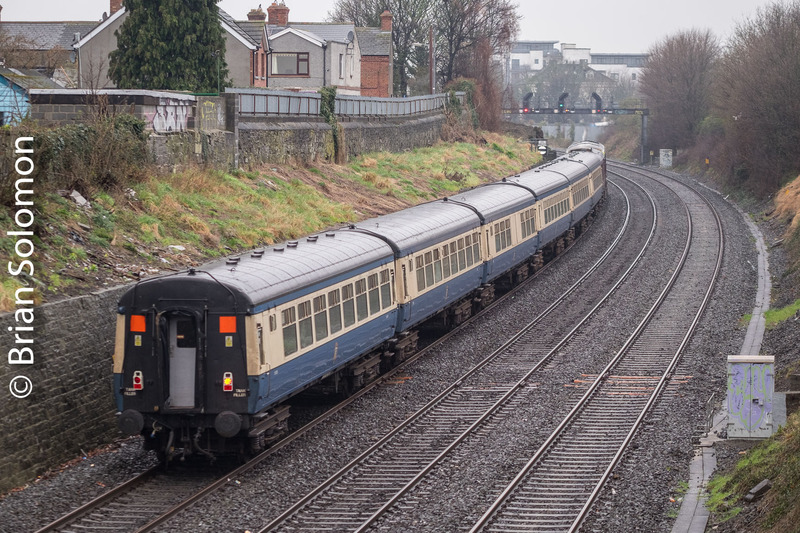 A southward Enterprise passes an NI Railways CAF set at City Hospital station. 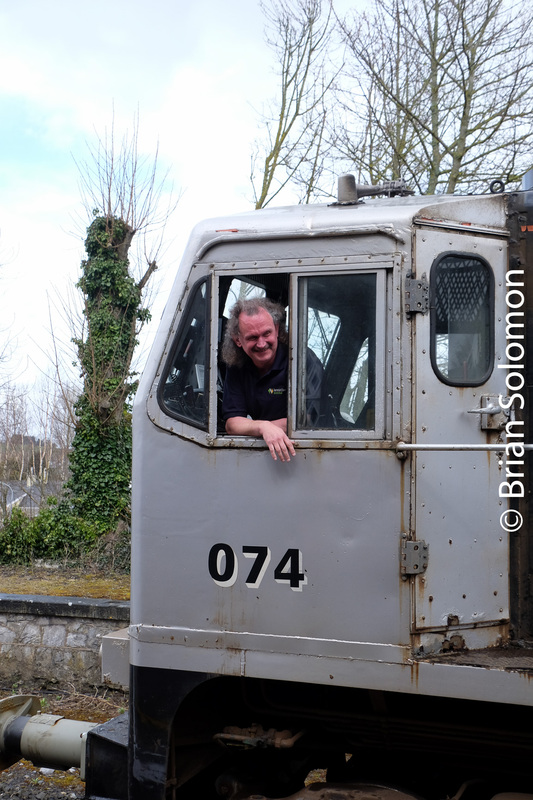 A cab control car normally works the Dublin-end of the Enterprise, as pictured here. Trailing view looking through the arches under Belfast’s Donegall Road toward the north junction connecting Great Victoria Street Station. (at right). 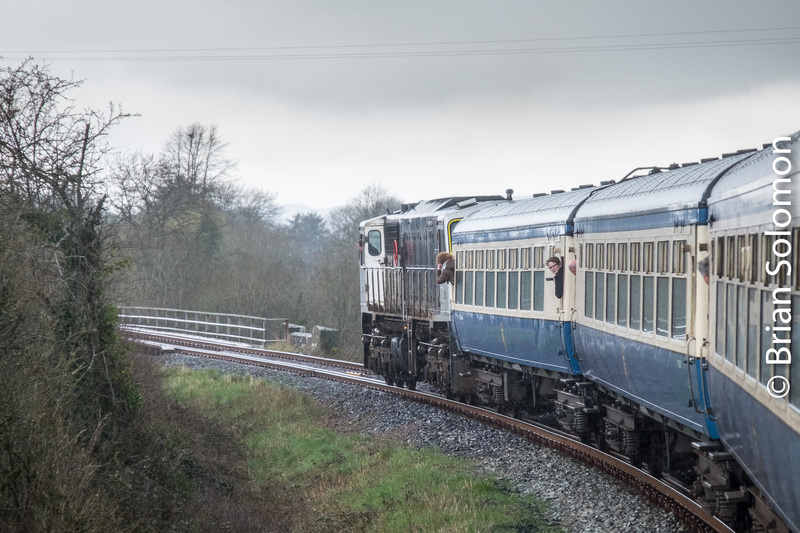 That’s Irish Rail class-201 number 207 shoving at the back of the train. Hmm 207, so this is a continuation of yesterday’s post is it? Horizontal version at the same location. 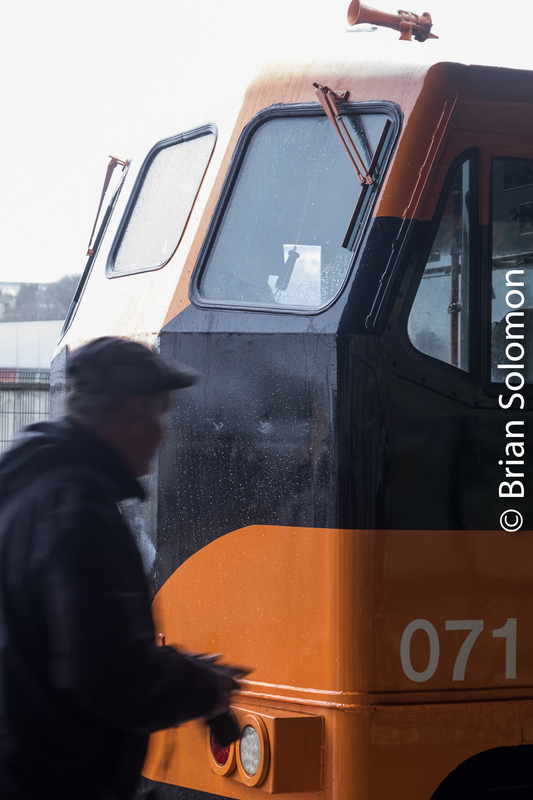 Class 201 Retrospective: Irish Rail 207—River Boyne; 7 photos. One locomotive; Three variations on the Enterprise livery. In the last 20 years, I’ve crossed paths with old 207 on a number of occasions. 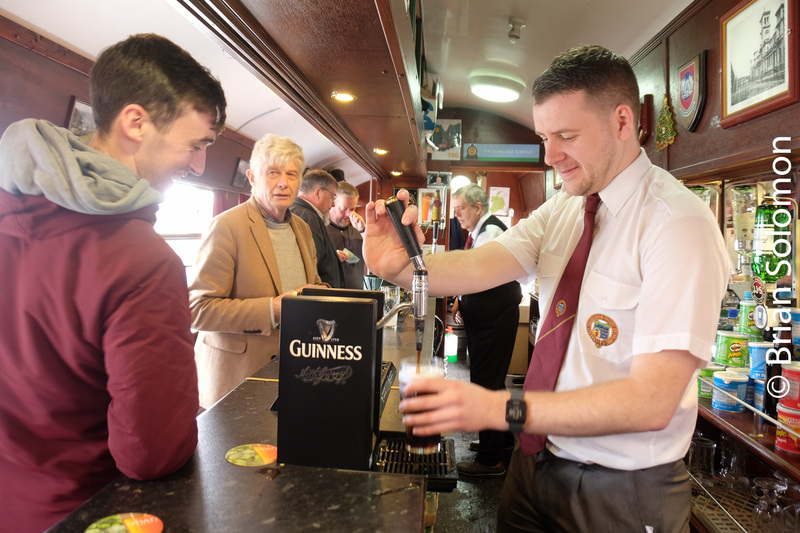 Often on the Enterprise,but elsewhere across Irish Rail as well. When I first saw 207, it looked like this with a rectangular yellow patch at the ends. I exposed this view on a tour of Connolly shed in August 1999. It was made using a Nikon F3T with 24mm Nikkor lens on Fujichrome Sensia II (100 ISO). File adjusted in Lightroom for contrast and colour balance. 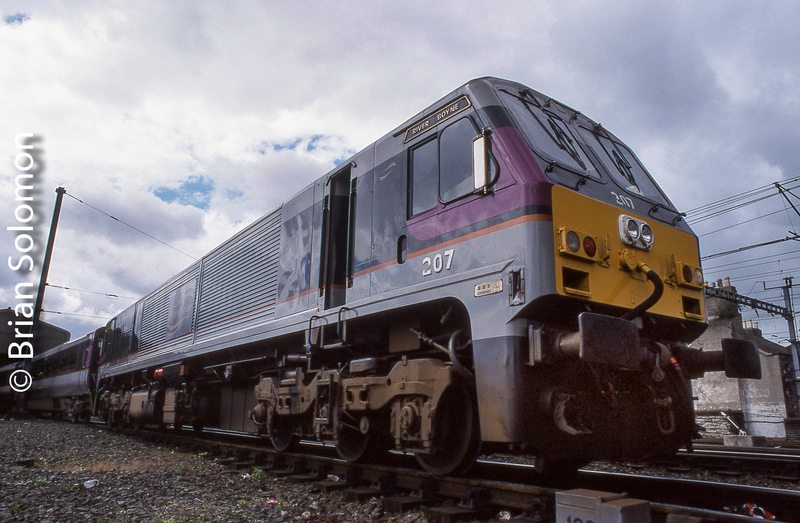 Irish Rail 207—River Boyne on the Enterprise at Belfast Central on 19 April 2000. 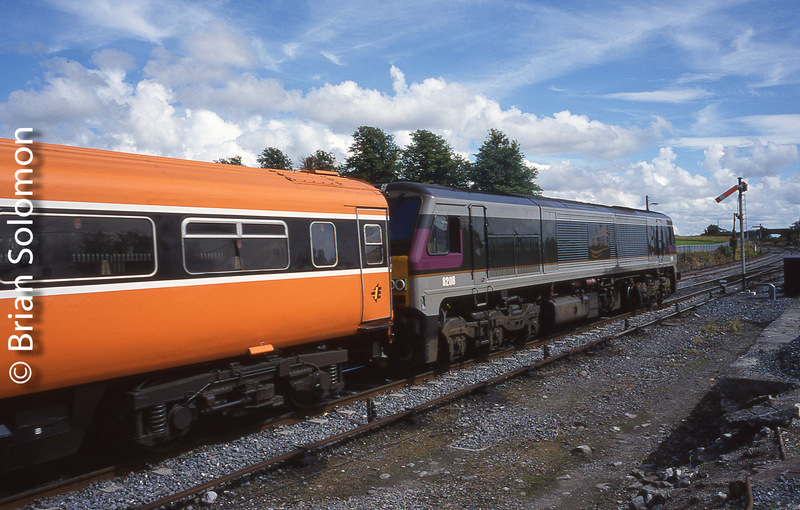 Irish Rail 207 in it’s revised Enterprise livery with larger and brighter yellow ends. This view was exposed at Inchicore works on 15 April 2007. Just over 11 years ago. 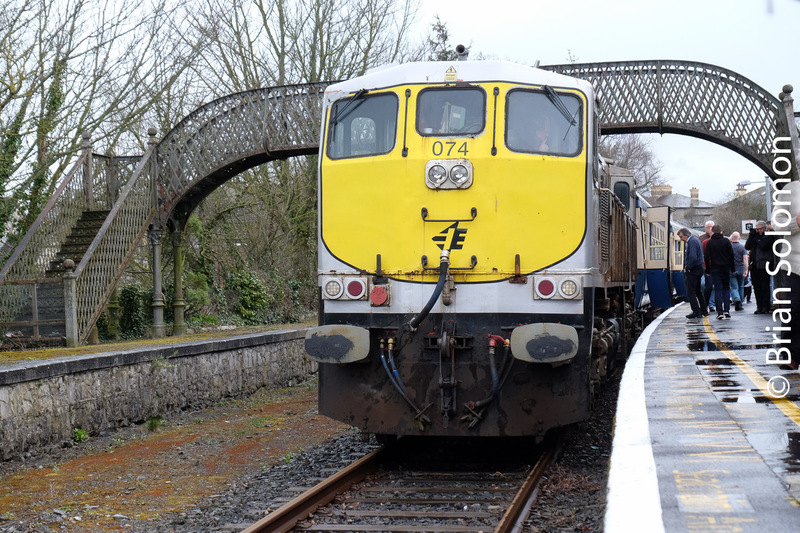 Lets just say something was amiss with 207 on 10 December 2007, when Irish Rail 171 towed the failed class 201 (#207) across from Connolly to Inchicore. 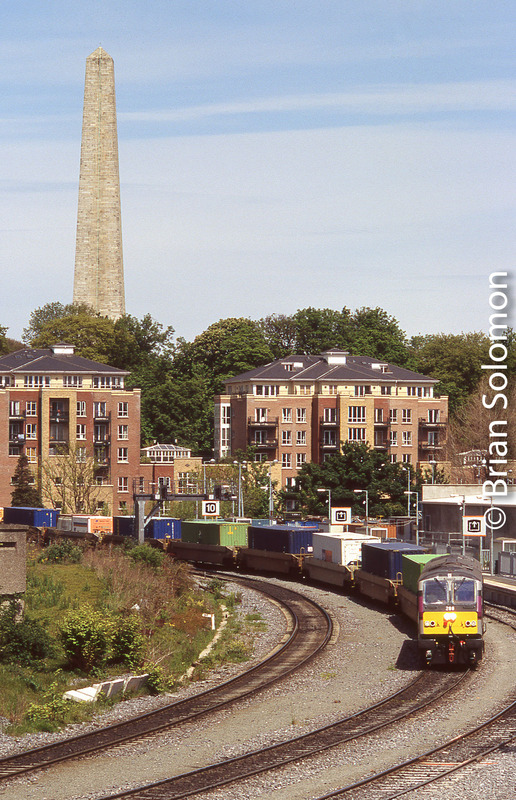 This view was made from my standard location at Islandbridge Junction in Dublin using a Canon EOS3 loaded with Fujichrome slide film. 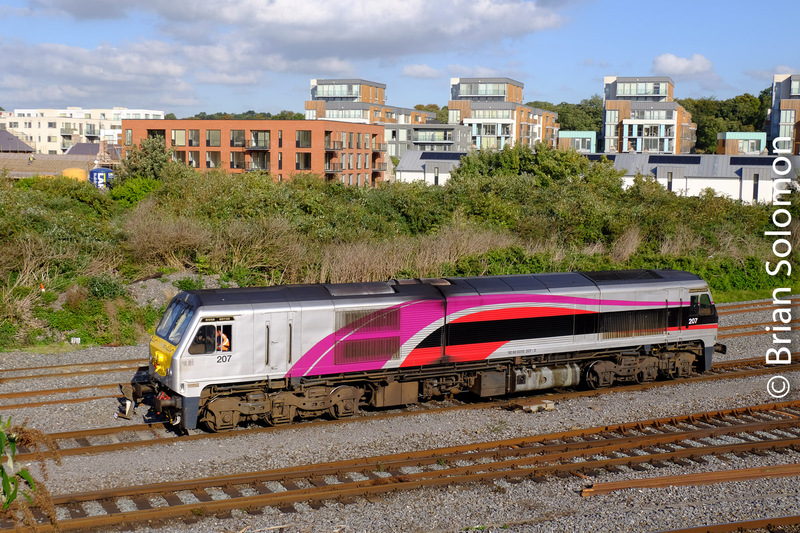 Today, it is one of several locomotives painted in the modern Enterprise livery with asymmetrical purple and scarlet swooshes along the sides. 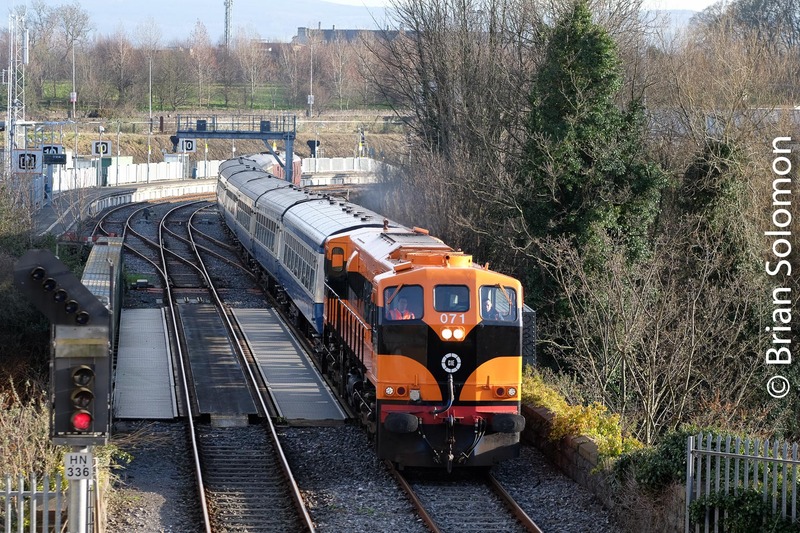 Another view of Irish Rail 207 from the same vantage point, 9 years after the above image. This one was exposed digitally on 6 October 2016. Same morning: 6 October 2016. 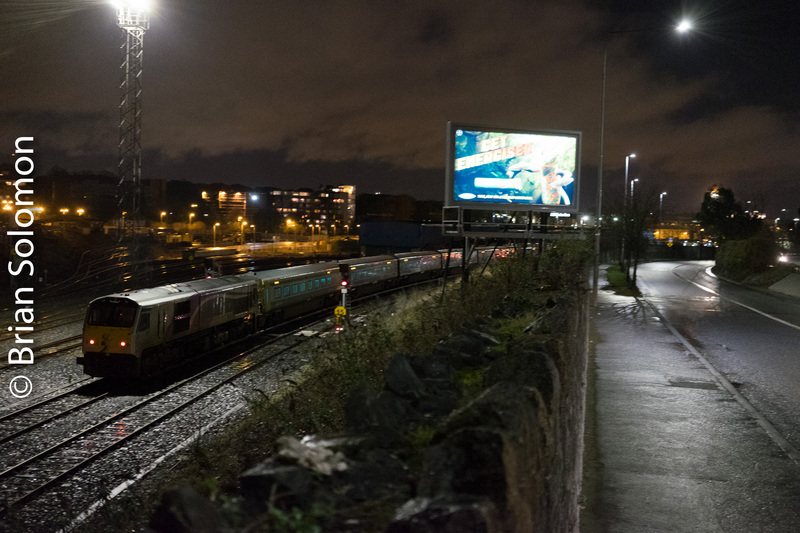 Nocturnal view at Islandbridge Junction of Irish Rail 207 working the Cork-Dublin Mark4 set on 21 January 2018. 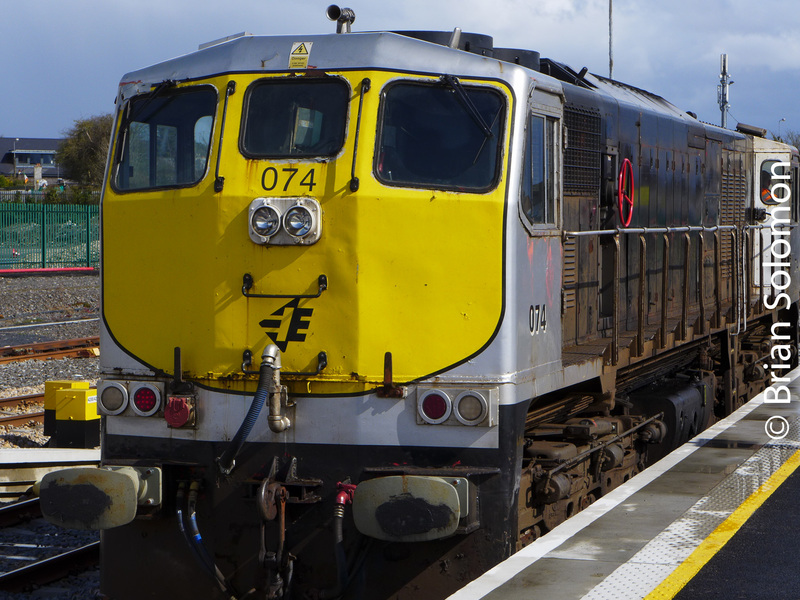 Do you have a favorite class 201 locomotive? Gotthard Pass 15 April 2016—Two Years Ago Today. On this day two years ago, my friends and I were exploring SBB’s magnificent crossing of Switzerland’s Gotthard Pass. This was just a few months before the official opening of the new long base tunnel, which diverted most of the through traffic away from the traditional crossing. 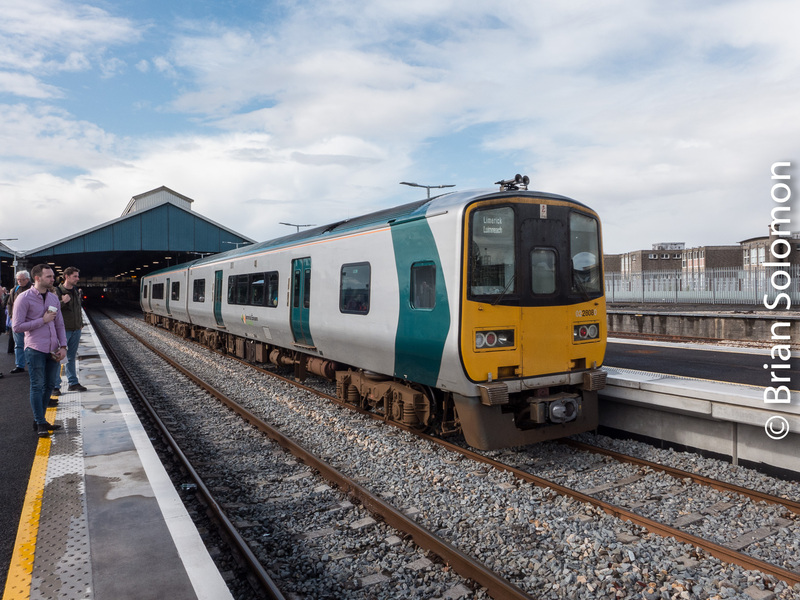 Today, an hourly regional passenger service is the primary way to travel of the old line. 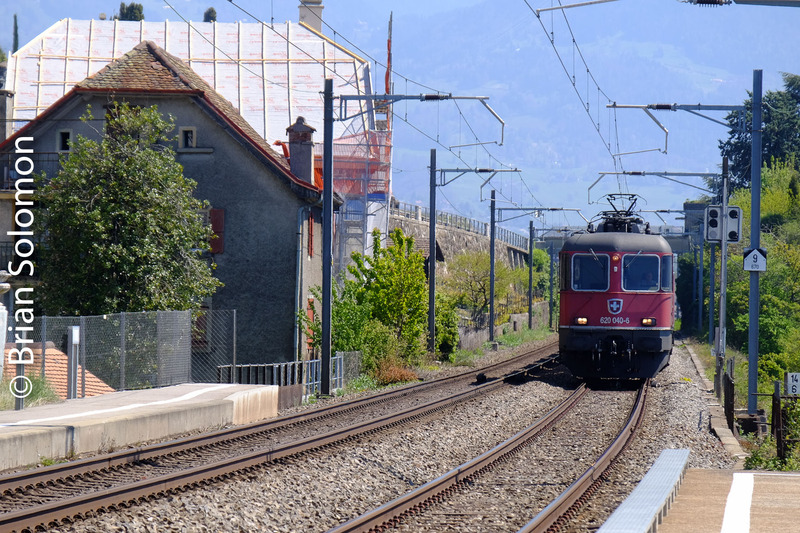 An SBB mixed freight ascends the old Gottard line at Gurtnellen. Behind me within the confines of the mountain is one of several spiral tunnels on the line. 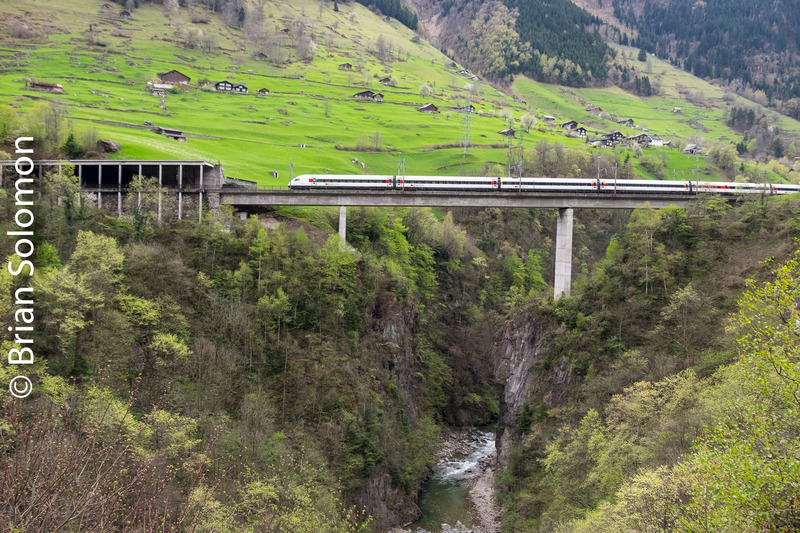 An SBB ICN tilting train crosses the Intschireuss Bridge on the Gotthard Pass. I made these views using my FujiFilm X-T1. 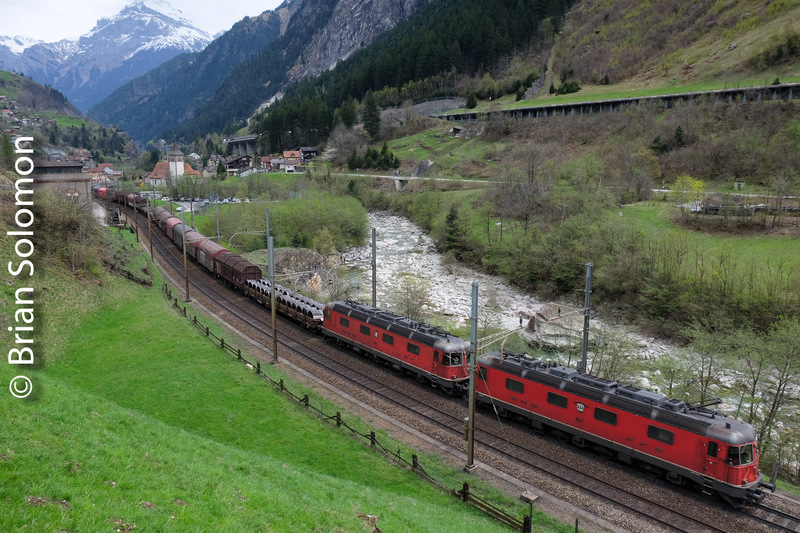 The Gotthard route is one of many scenic journeys profiled in my new book on European railways published by Kalmbach Publishing this Spring. Blue and Silver Train on a Gray Day. I’d arrived at Adelaide Station in Belfast on this NI Railways 4000-series CAF railcar from Portadown. Although it was windy, spitting rain and dull, and I had made photos at Adelaide at various times in recent months, I exposed this view anyway. You never know when the common will seem fascinating. Someday something in this scene will be gone, and then the picture may take on new significance. Lumix LX7 photo at Adelaide in Belfast. Tracking the Light has posted daily for nearly five years. 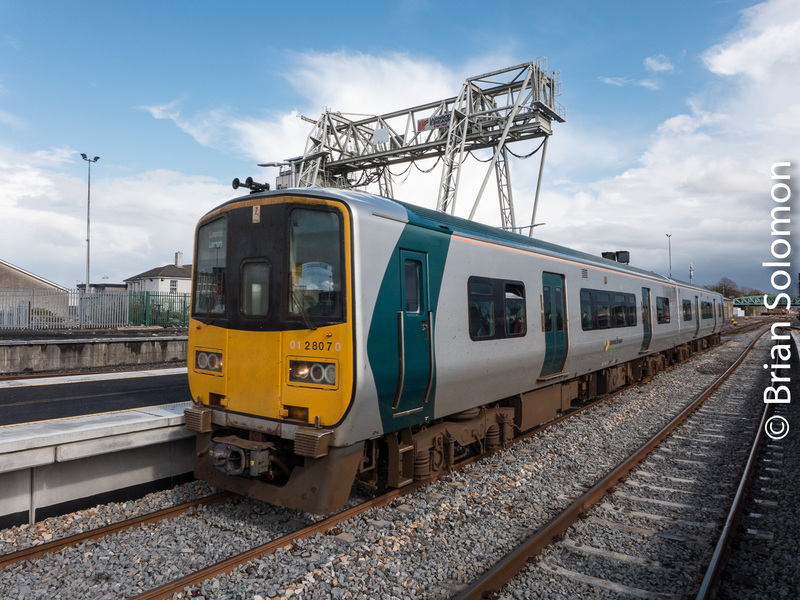 Class 201 Retrospective: Irish Rail 206, the first of the Enterprise 201s. 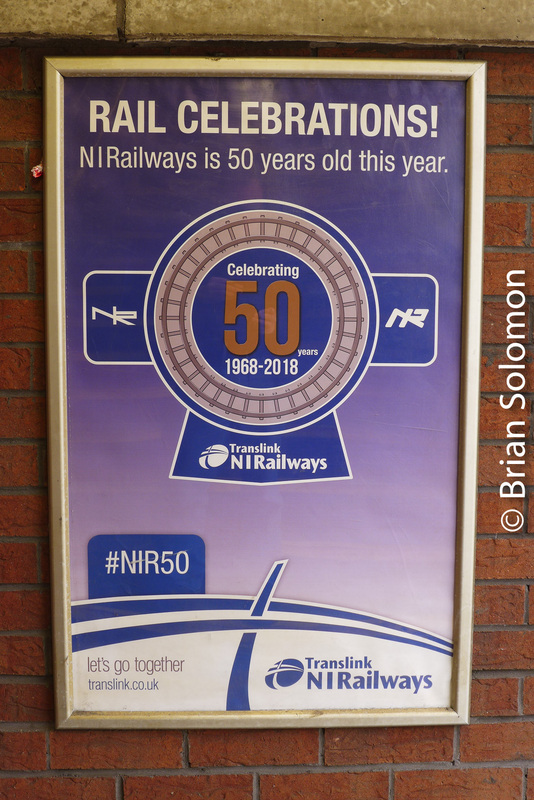 As part of my 20 years in Ireland/201 numerical retrospective, this is my opportunity to present a few views of Irish Rail 206. 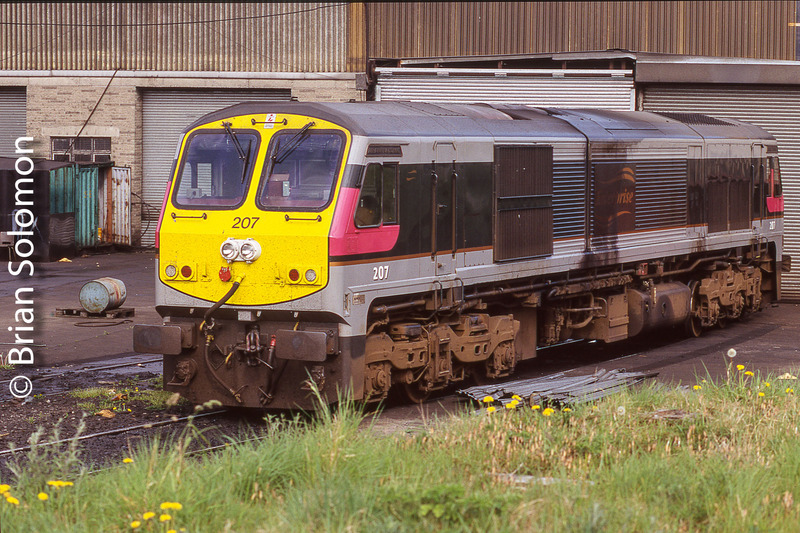 When I first arrived in Ireland in 1998, 201-class locomotives numbers 206 to 209 (as they were then identified) were painted for the cross-border Belfast-Dublin Enterprisepassenger service. 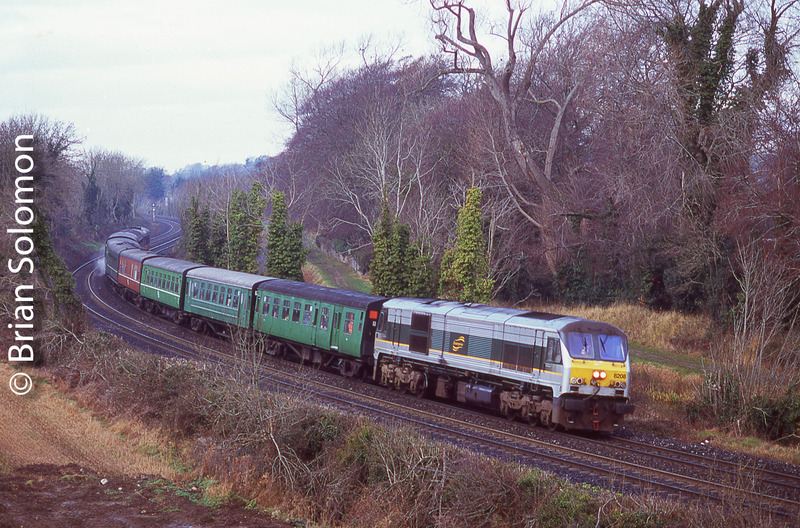 On 4 March 2000 Irish Rail 206 works the Enterprise at Donabate. Exposed on Fujichrome Sensia II (ISO100) using a Nikon F3T. 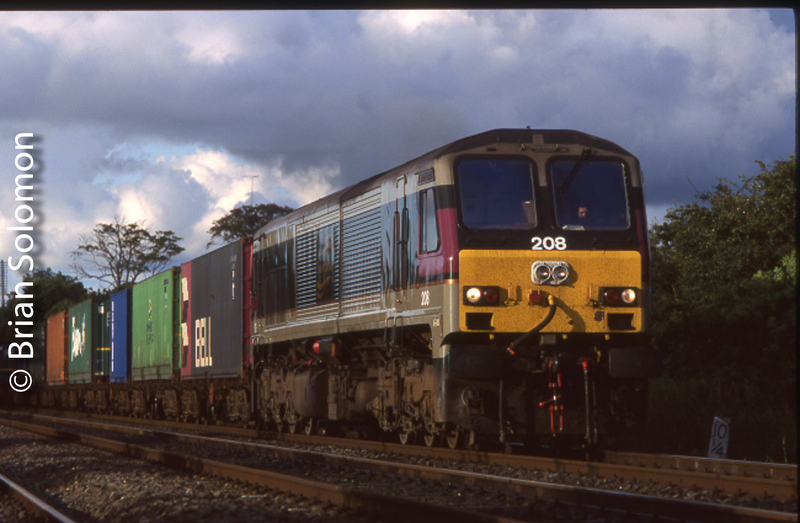 On 11 May 2005, Irish Rail 2005 was ‘ex works’ following overhaul after its fire, making one of many trips on a Liner (point to point freight). 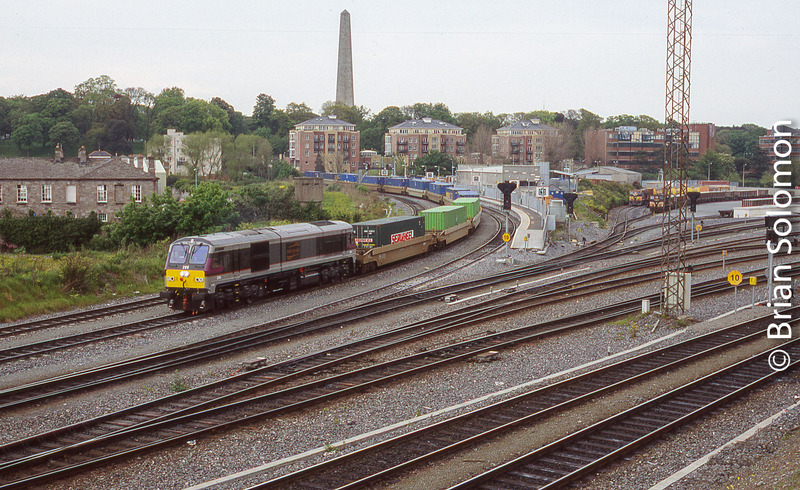 It passes Islandbridge Junction, one of my often used locations. Exposed on Fujichrome using a Contax G2 rangefinder. 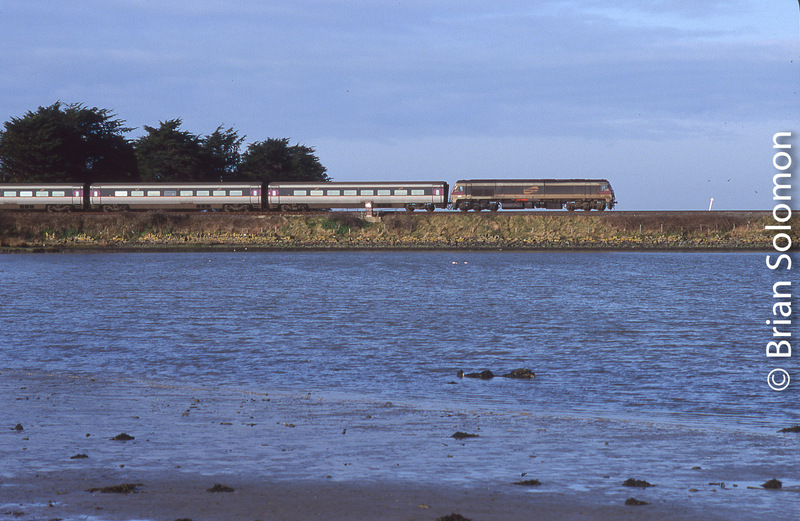 Same location, same train on 17 May 2005. Here I’m using a 135mm telephoto lens on my Nikon F3T to bring in the Wellington Testimonial (obelisk). And almost the same angle on 16 December 2010, this time captured digitally using a Canon EOS 7D. So while these are three photos of the same locomotive on similar trains at essentially the same location, each features a different treatment as result of changes in lighting, season, type of camera, lens focal length, and the angle of composition. It is my understanding that these four numbers were chosen for the Enterprise201s to pay historical tribute to steam locomotives of the same numbers that had worked the service in an earlier era. 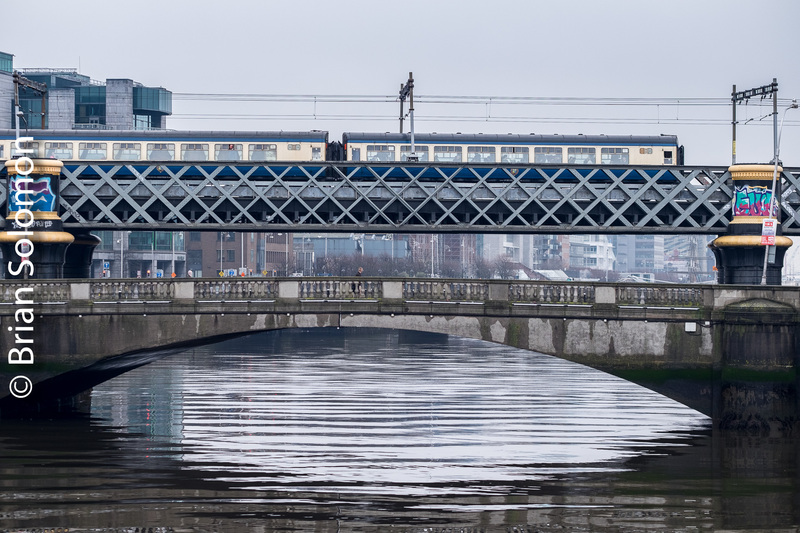 Of the four, 206 River Liffey has been my favorite, but until relatively recently it is also one of the more elusive 201s in passenger service (in regards to my photography). Around 2002, it suffered a fire and was out of traffic for about three years. When it returned, it spent months working freights. Only recently, have I again found it regularly working as intended. 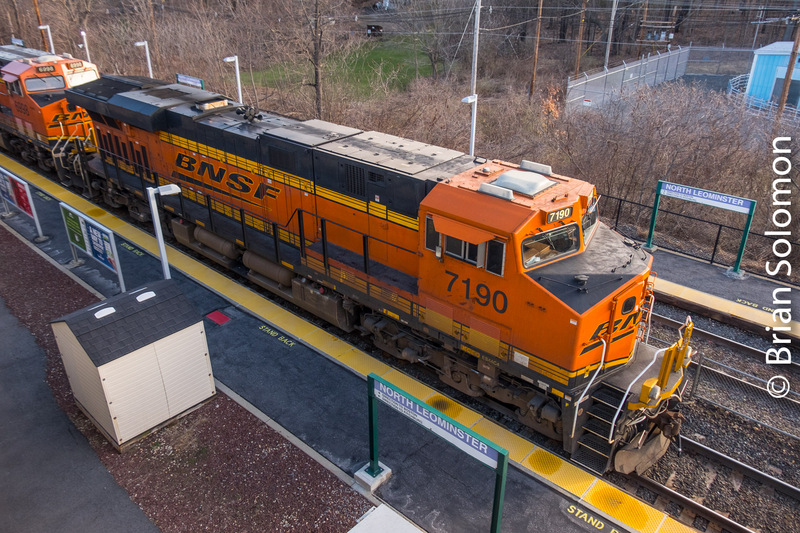 It now wears the latest Enterprise livery, which is laterally asymmetrical and features a giant purple swoop across the side of the locomotive. 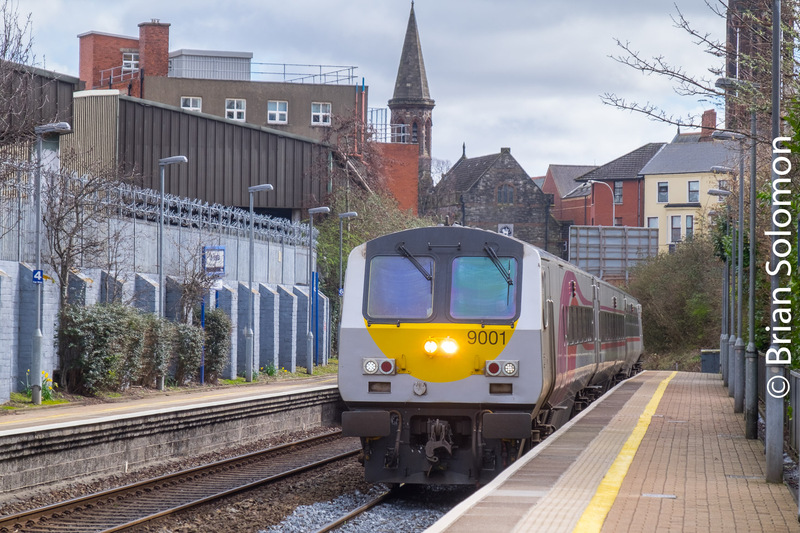 I made this digital photo of 206 at Belfast Central Station on 26 March 2018, working as intended. Lumix LX7 photo. The high angle allows for good detail of the roof, which is not often seen from ground level. Wisconsin & Southern at Reedsburg, Wisconsin. In July 2016, John Gruber and I photographed Wisconsin & Southern’s Reedsburg job on its run from Madison to Reedsburg. Although, I made many digital photographs that day, I also exposed a few photos on Ilford Pan F using a vintage Leica IIIA fitted with a Nikkor f3.5 35mm lens. Notice how the tonality and texture of the image draws your eye in a variety of directions. The effects of tire tracks in the gravel and the pole shadows are enhanced through use of a monochromatic image making medium. 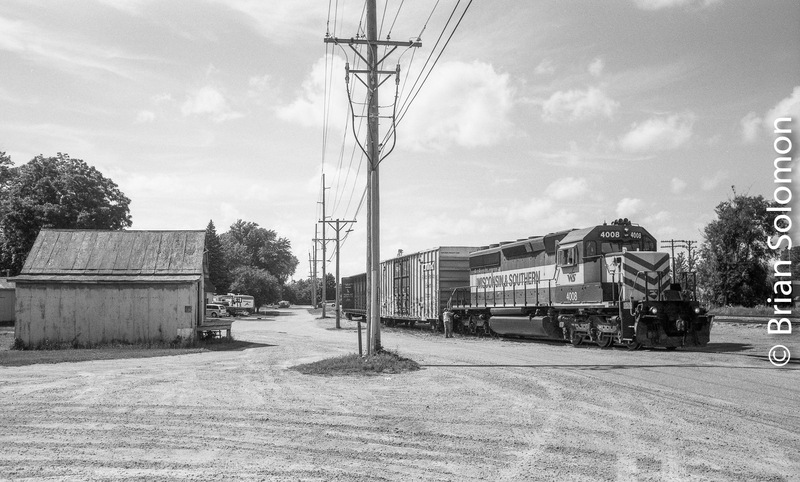 Reedsburg, Wisconsin in July 2016. Brian Solomon’s Tracking the Light Posts Daily and sometimes twice. 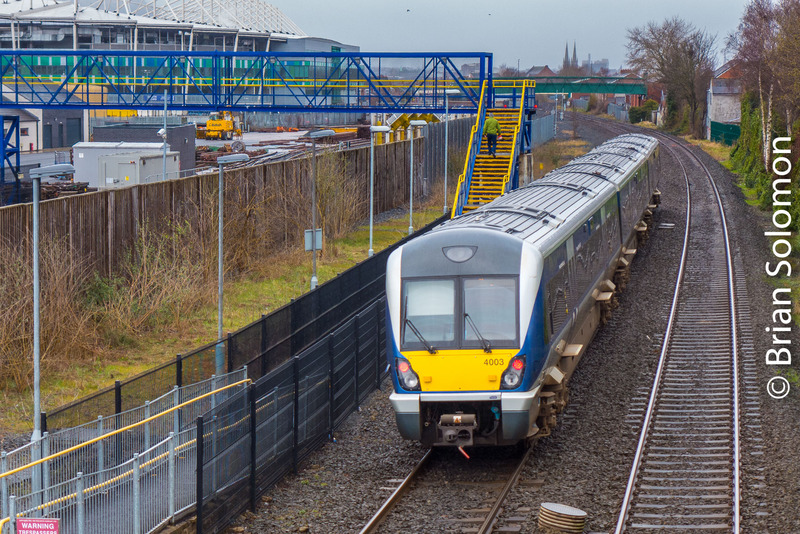 On Saturday, 7 April 2018, I made these photos of an Irish Rail 2800-series railcar working a Western Rail Corridor service from Galway arriving at Limerick’s Colbert Station. I used my Lumix LX7, then working with the RAW files in Lightroom, made nominal adjustments to colour temperature, contrast and highlight density. 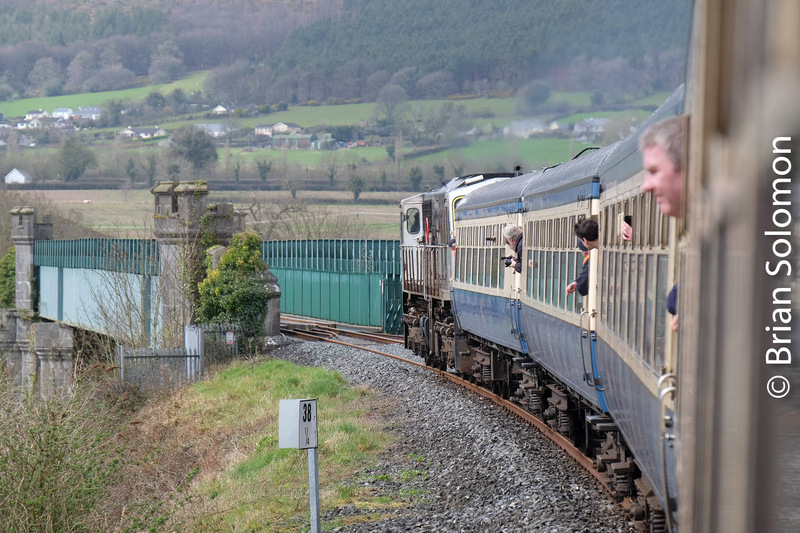 Lumix LX7 photo at Limerick. Tracking the Light Posts has posted Daily for almost five years. 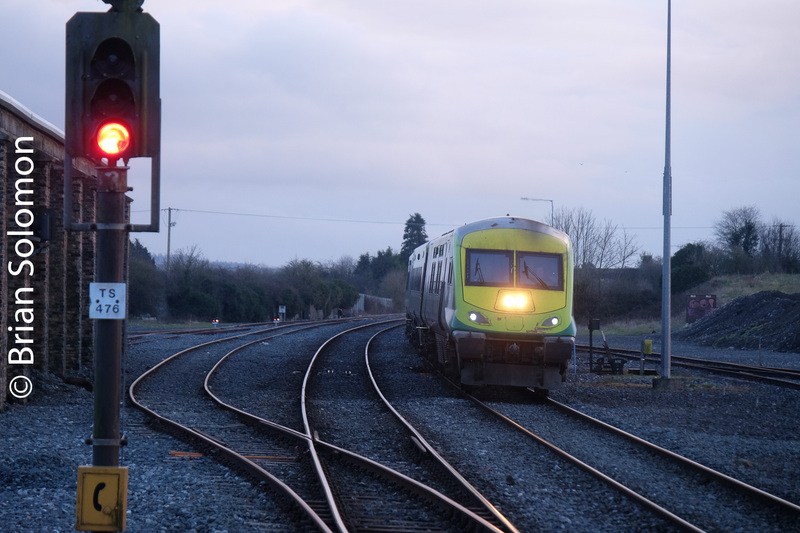 Irish Rail 074 at Limerick; A study in contrast—Four New Photos. 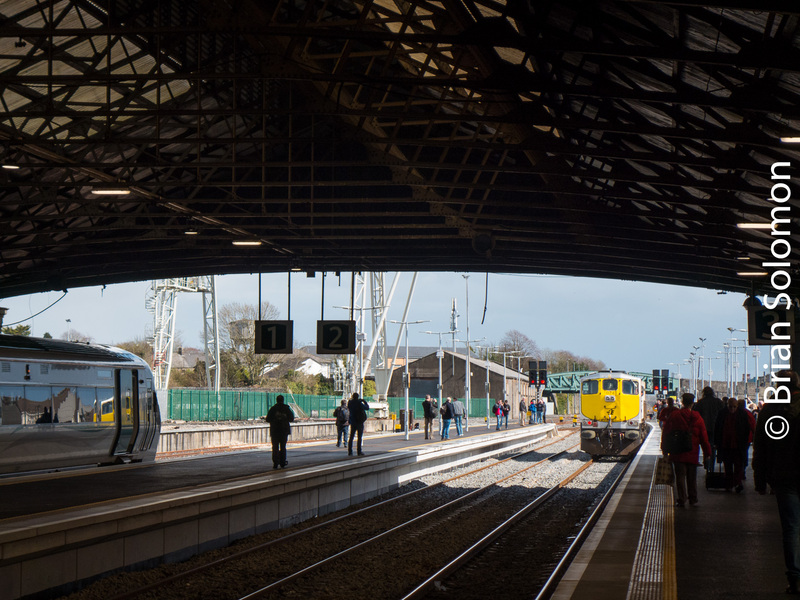 Under the train shed at Limerick’s Colbert Station is dark and gloomy. Outside it had been raining. Then the clouds drew back and brilliant midday sun blasted across the city. Bright sun and inky shadows. I made these views using my Lumix LX7 on Saturday, 7 April 2018. 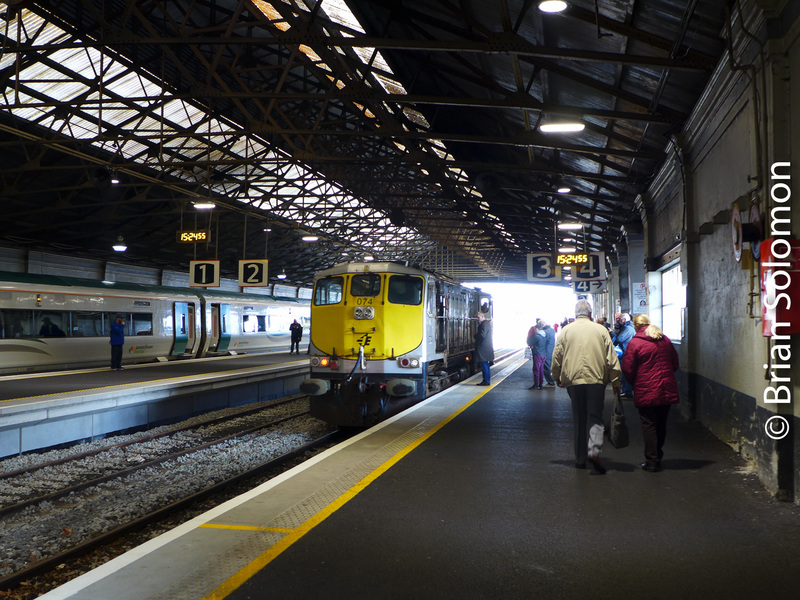 Irish Rail 074 catches a wink of light under the train shed at Limerick Colbert Station. Contrast of light and dark makes for a study in silhouette and vivid daylight. (File adjusted in post processing). Irish Rail 074 up close and personal. 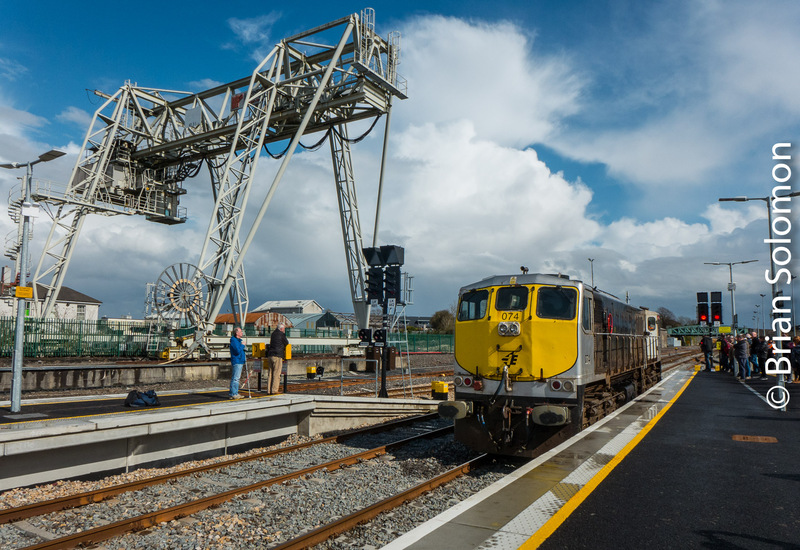 How many years has it been since Irish Rail last used the gantry for revenue freight at Limerick? Cherry Blossoms at Heuston Station. The cherry trees are about two weeks later to blossom in 2018 than last year. I made this view with my Lumix LX7 on a bright evening a few days ago. 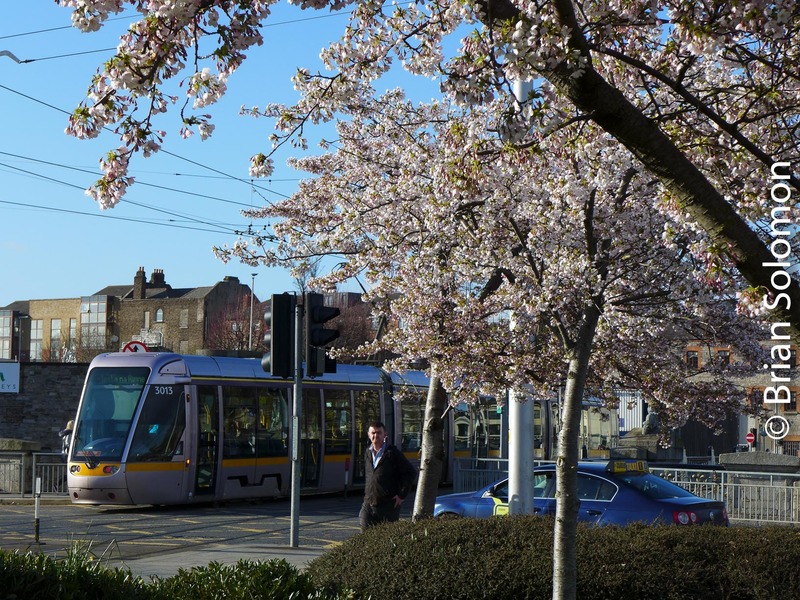 A LUAS tram near Heuston Station, Dublin. 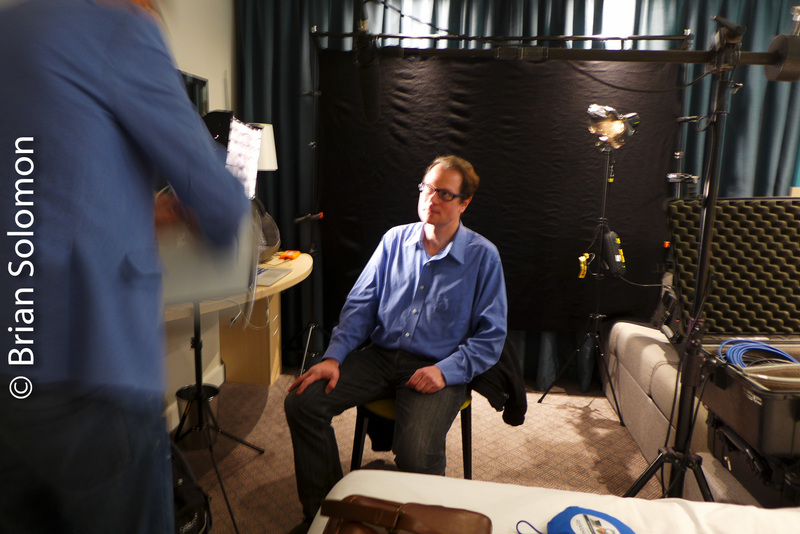 Tracking the Light Extra: Interviewed in Bristol. 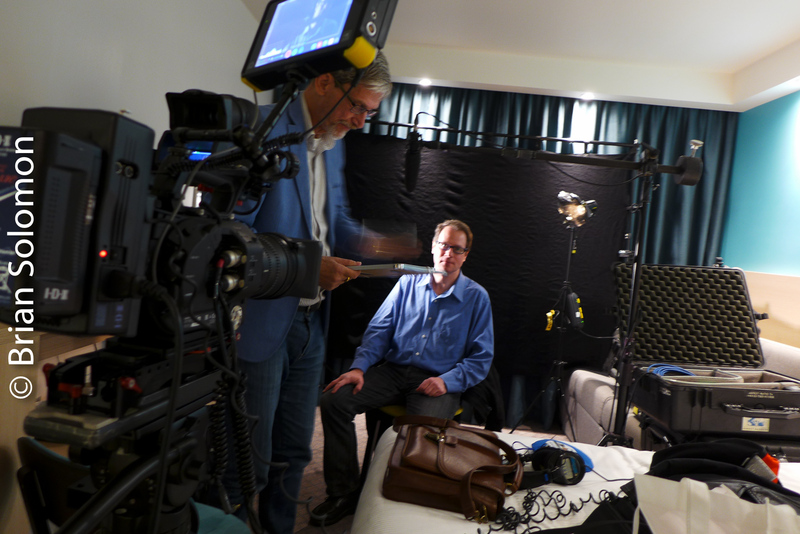 Today I flew from Dublin to Bristol (UK) to be interviewed by Michael Cove of Australia’s WildBear TV. My conversations included history of railways in the UK, Ireland, mainland Europe and North American among other places. Although it may not be used, I gave my new book a plug. Here’s a few Lumix photos from the trip. 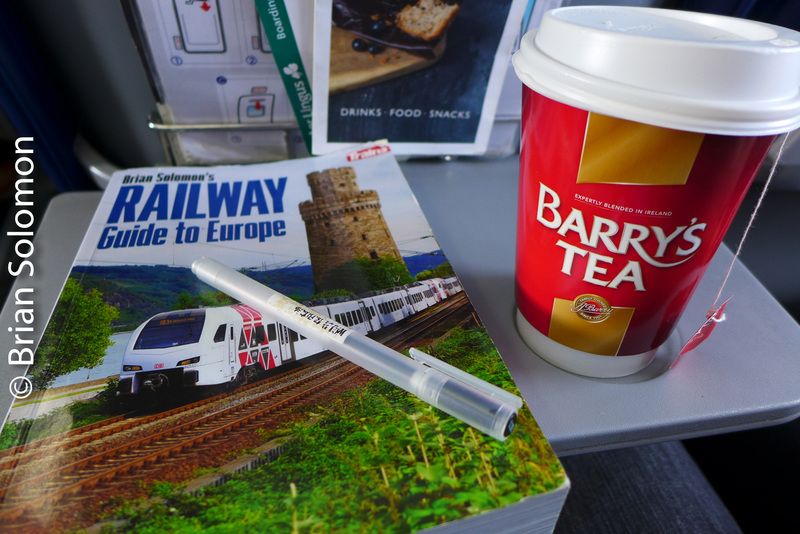 My new guide book on European Railway Travel on the plane with a cup of Barry’s Tea. The weather is foul in Bristol. There I am waiting for the cameras to begin rolling. Photo by the camera crew. I haven’t seen any steel wheel vehicles, but I made a photo of a bus. 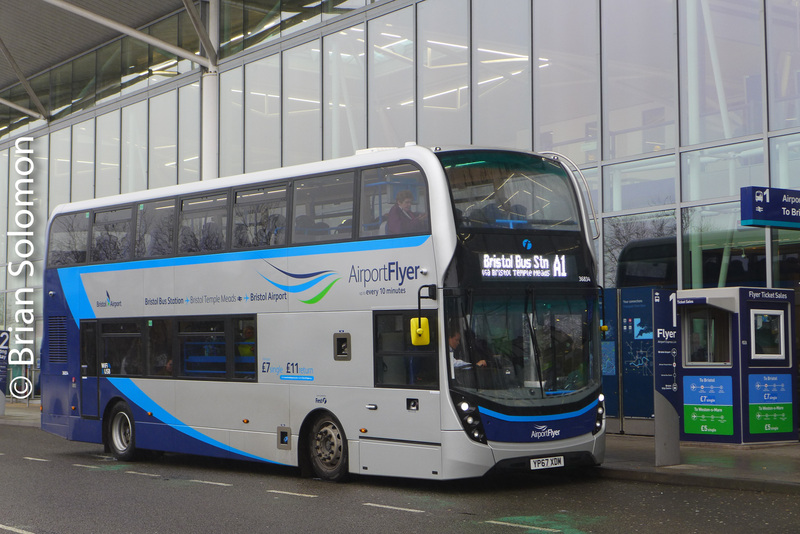 I’m waiting for the hop back to Dublin; Bristol airport has free wifi! 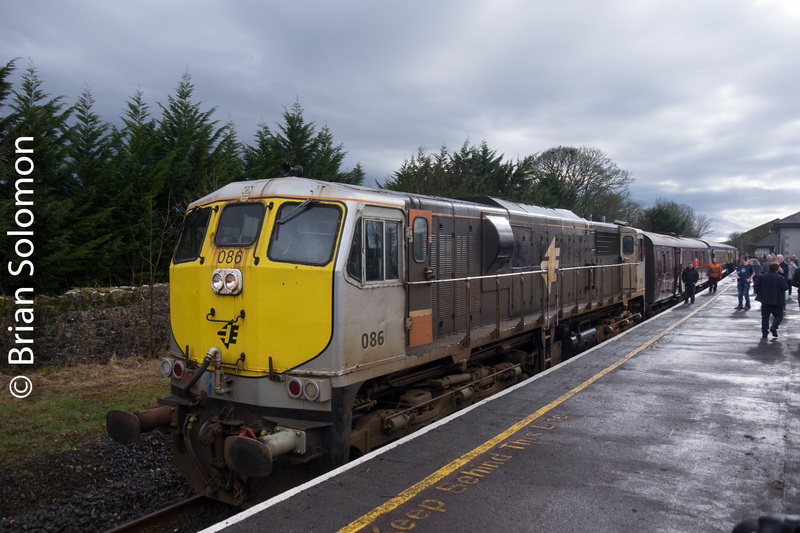 Here’s another section of images from last Saturday’s The Branch Line Wanderer, an RPSI excursion that visited various Irish secondary lines. I exposed these photos using my FujiFilm X-T1. 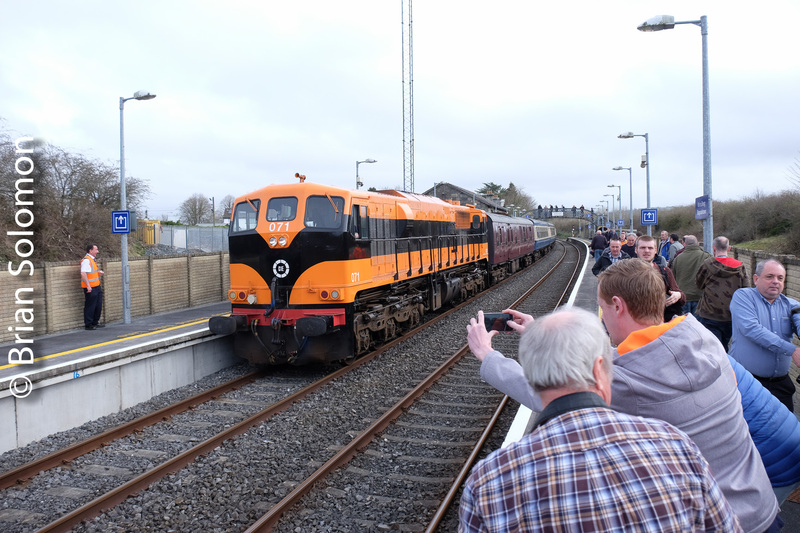 The trip was operated by Railway Preservation Society of Ireland in conjunction with Irish Rail. 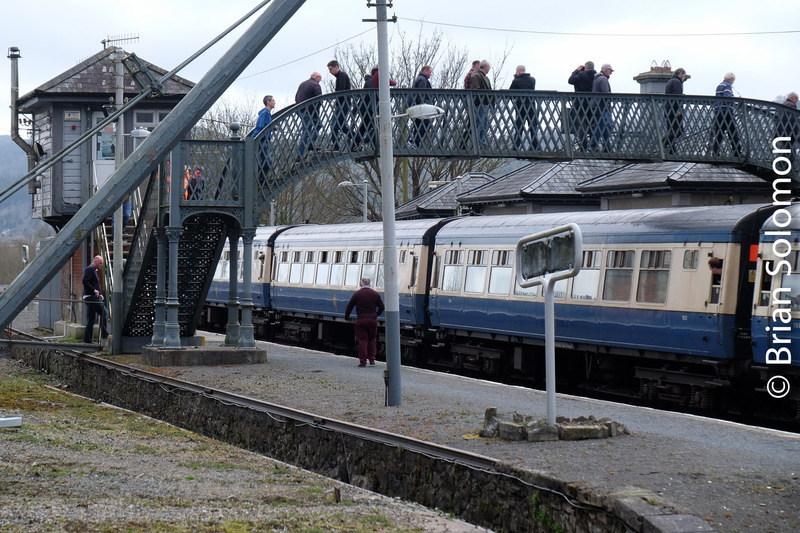 Cloughjordan on the Nenagh Branch.Cloughjordan on the Nenagh Branch. Cloughjordan on the Nenagh Branch. 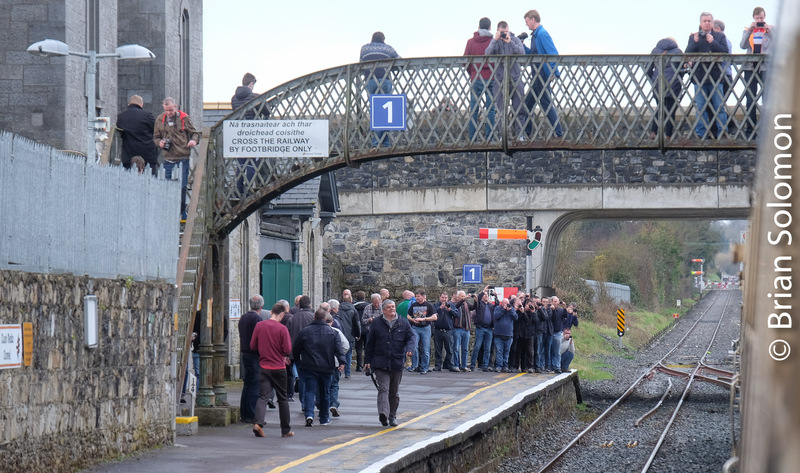 Irish Rail down Mark 4 at Thurles. 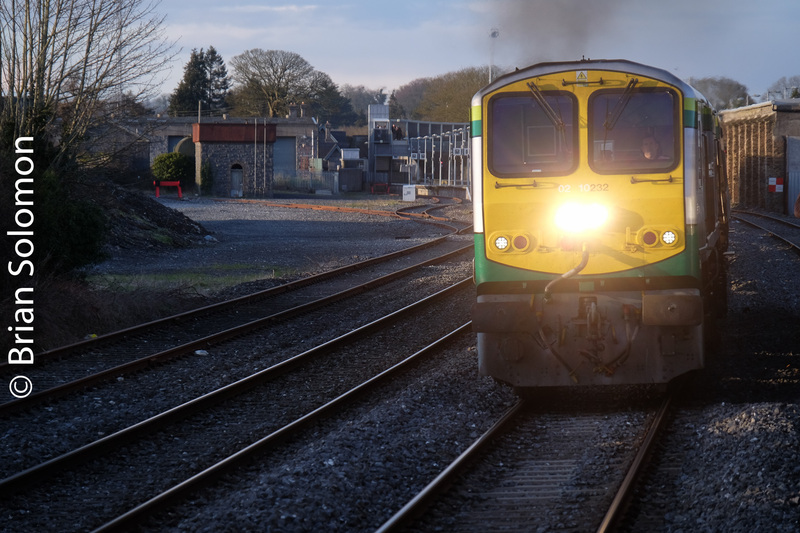 Irish Rail up Mark 4 at Thurles. Sunset from RPSI train near Templemore. Brian Solomon’s Tracking the Light publishes daily! 18 New Photos: RPSI’s The Branchline Wanderer—Retro Diesel Train Flashback. 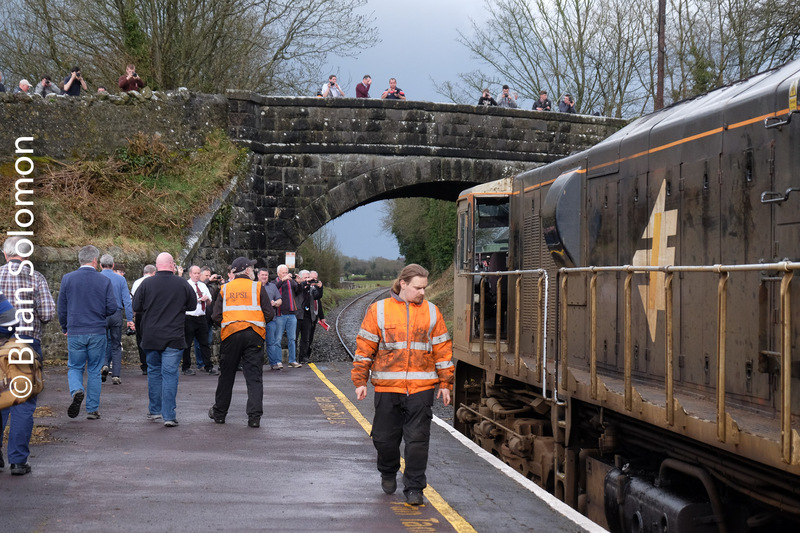 Yesterday, 7 April 2018, Railway Preservation Society of Ireland in conjunction with Irish Rail operated its The Branchline Wanderer. 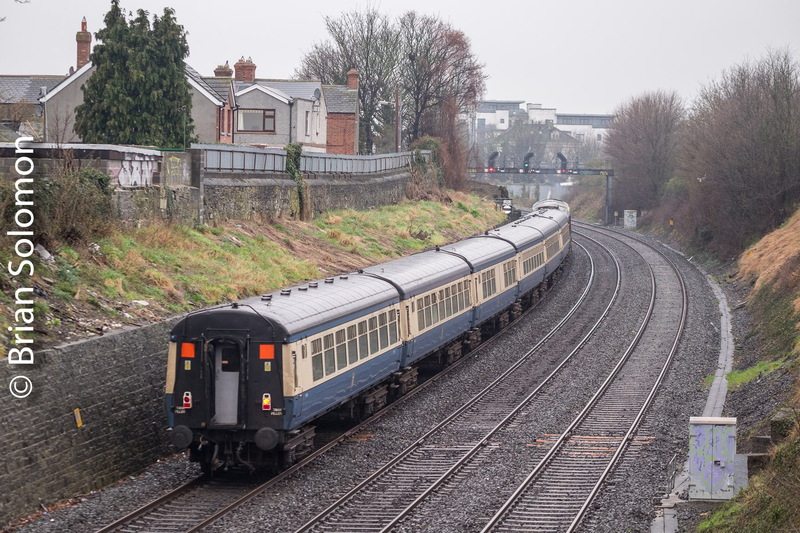 This covered several lightly traveled lines, including the Waterford-Limerick Junction section, which was a favorite of mine in years gone by. The trip was well patronized. 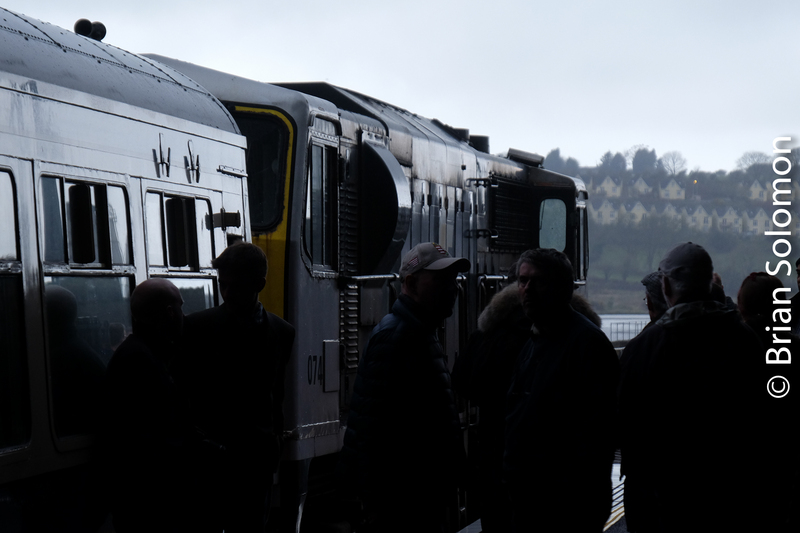 Despite wildly varying weather, I found numerous opportunities for interesting photos of RPSI’s train, its crew and passengers, and the places we visited. 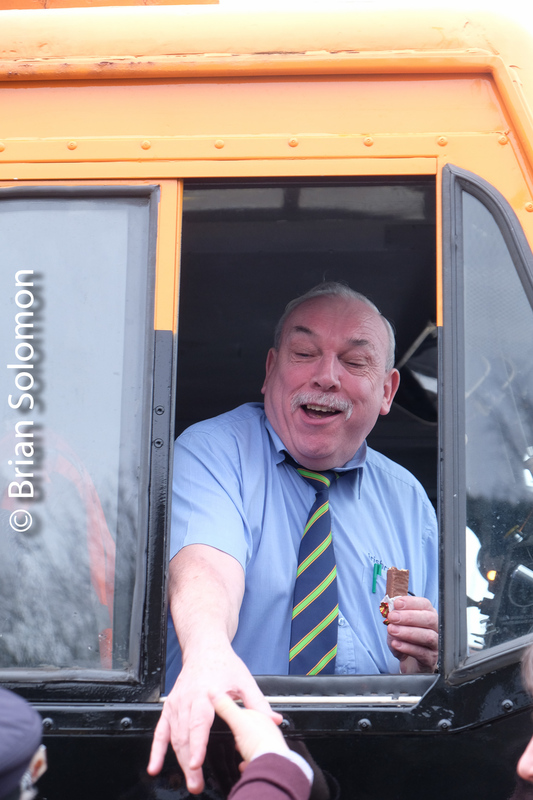 Special thanks to RPSI’s Operating Crews and Irish Rail staff for an excellent day out. This display represents the first few hours of photos exposed with my FujiFilm XT1. This was one of four cameras I used on the day. More photos to follow. 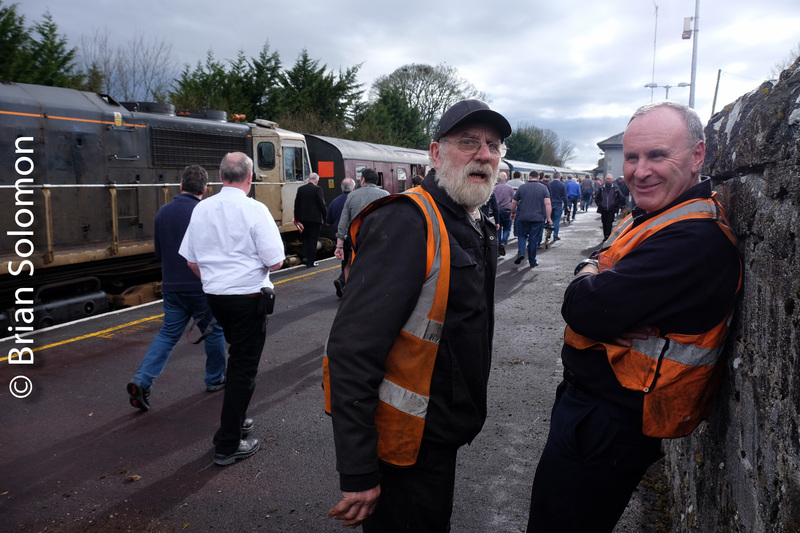 If everything has gone according to plan, as you read this I’m traveling upon Railway Preservation Society of Ireland’s diesel-hauled Branchline Explorer rail tour. 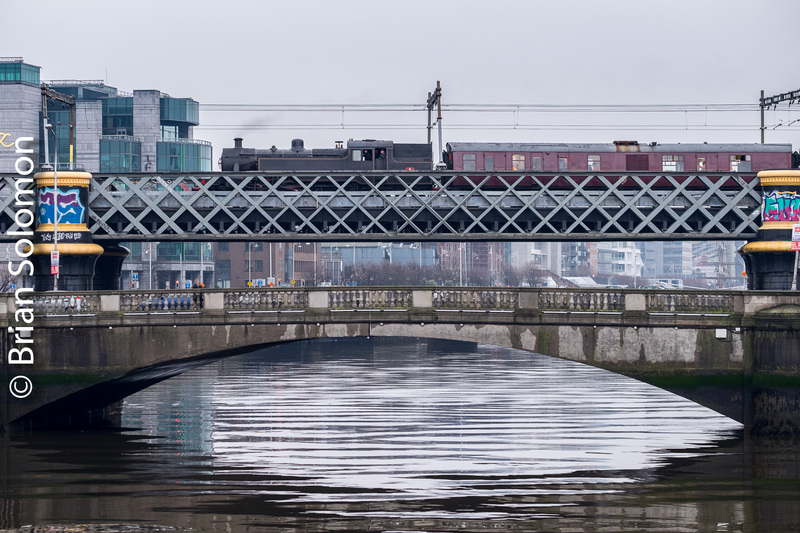 I made this photo on 6 April 2018 of Irish Rail 071 (in 1970s heritage livery) leading the RPSI preserved Cravens carriages across the River Liffey at Islandbridge in the fading light of the evening. 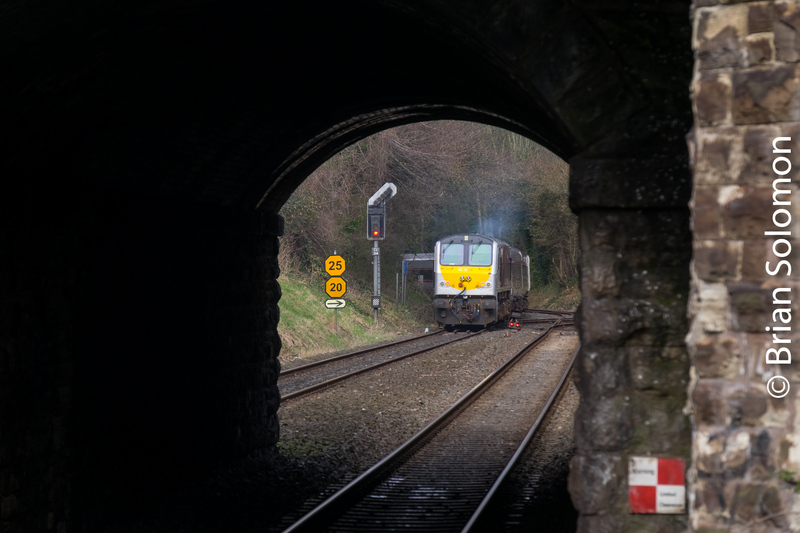 An Irish Rail ICR working Grand Canal Docks suburban service exits the Phoenix Park Tunnel on 6 April 2018. 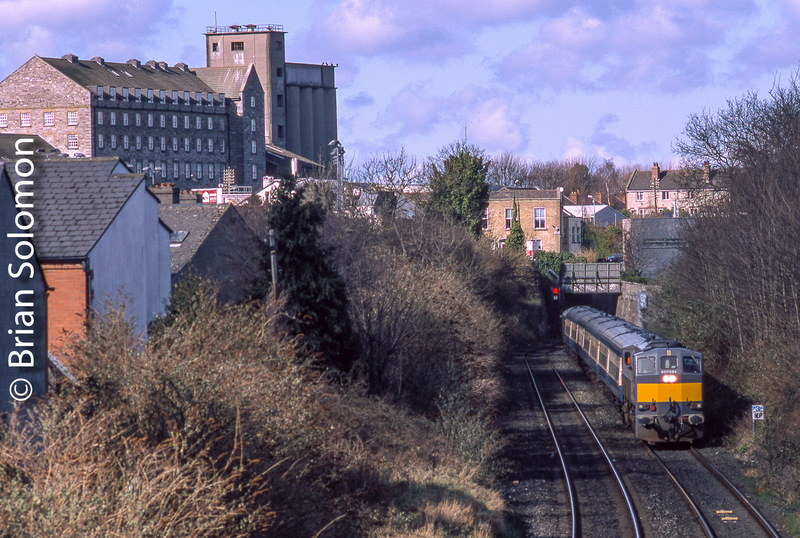 Irish Rail 071 with RPSI Cravens can be seen in the distance. Exposed digitally using a FujiFilm X-T1 camera fitted with a 90mm f2.0 telephoto lens. 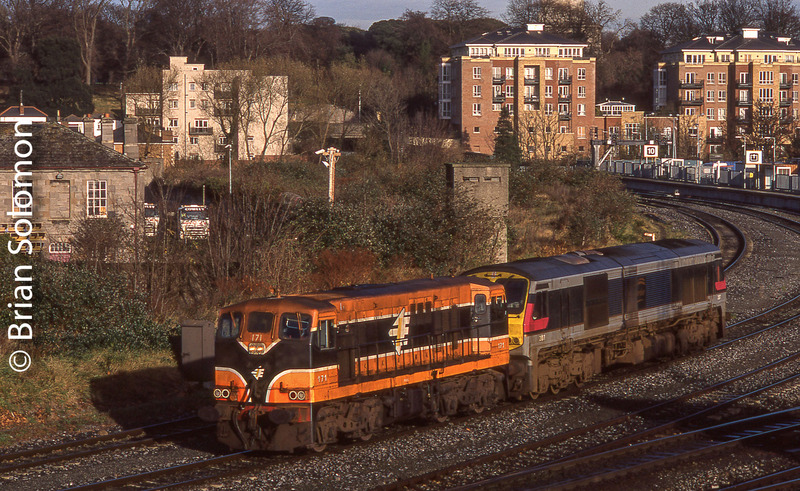 An instant classic: Irish Rail 071 (class leader in retro paint) leads the RPSI Cravens across the River Liffey at Islandbridge in Dublin. Exposed digitally using a FujiFilm X-T1 camera fitted with a 90mm f2.0 telephoto lens. On 6 April 2017, I spent the morning in Rome researching for my new book on European Railways. 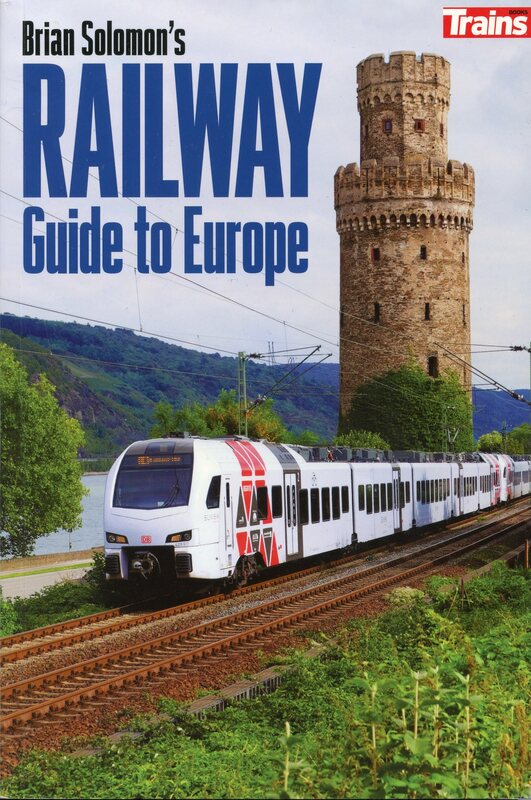 You can order Brian Solomon’s Railway Guide to Europe from Kalmbach Books. These photos were exposed using my Lumix LX7. 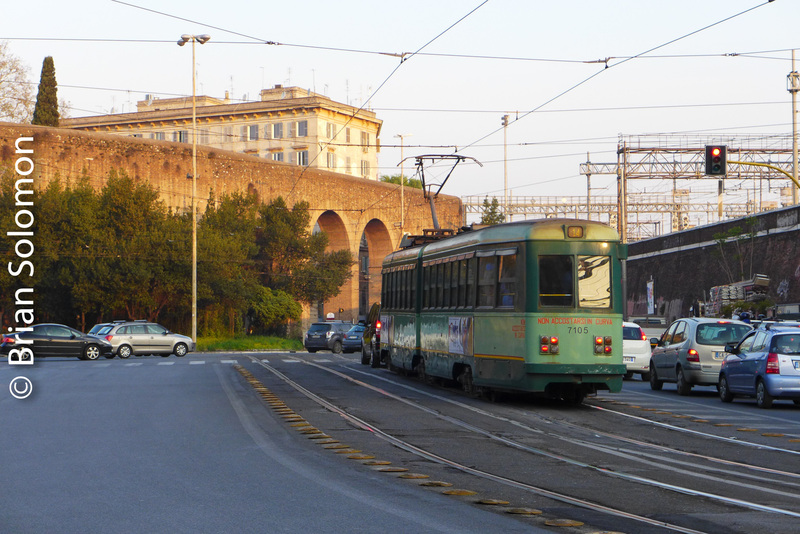 Antique Roman trams and city wall. 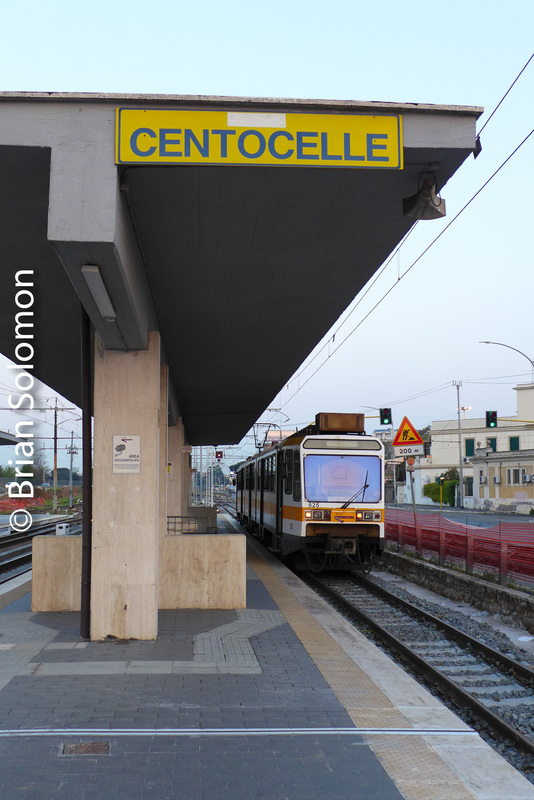 Narrow gauge interurban tram at Centocelle, which was effectively the end of the line on the day I visited. 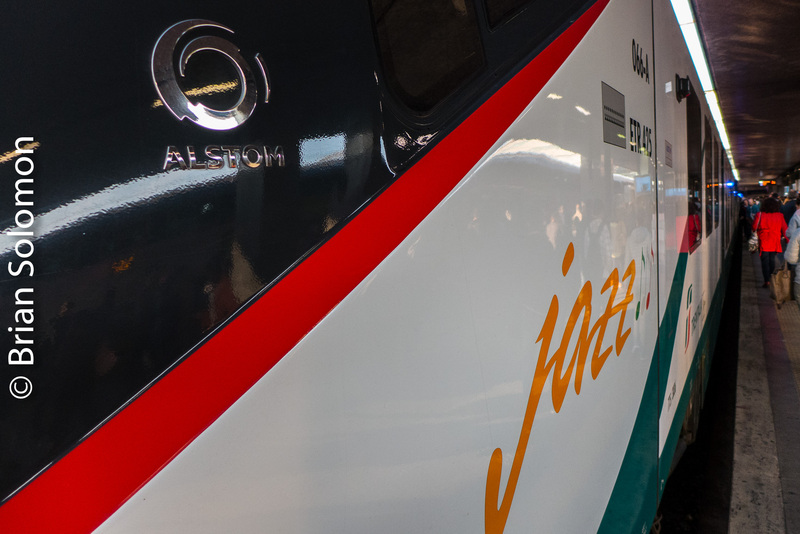 An Alstom-built electric railcar at Roma Termini. 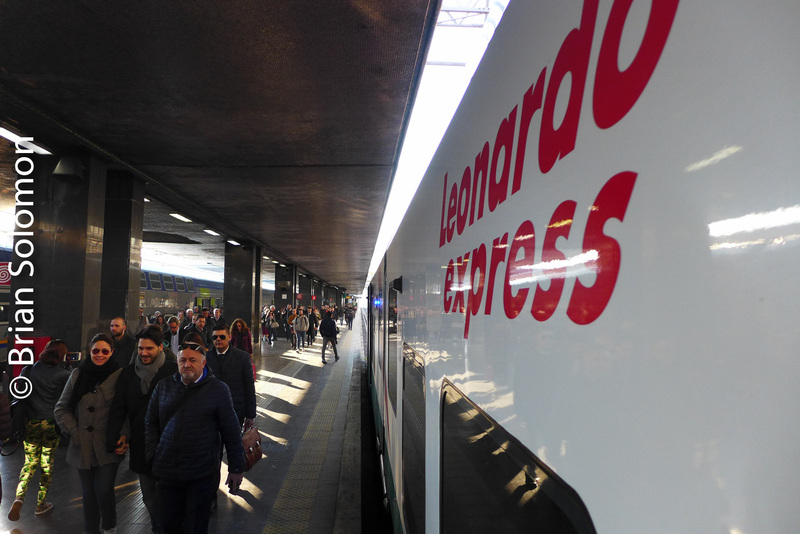 Rome’s Airport train at Roma Termini. 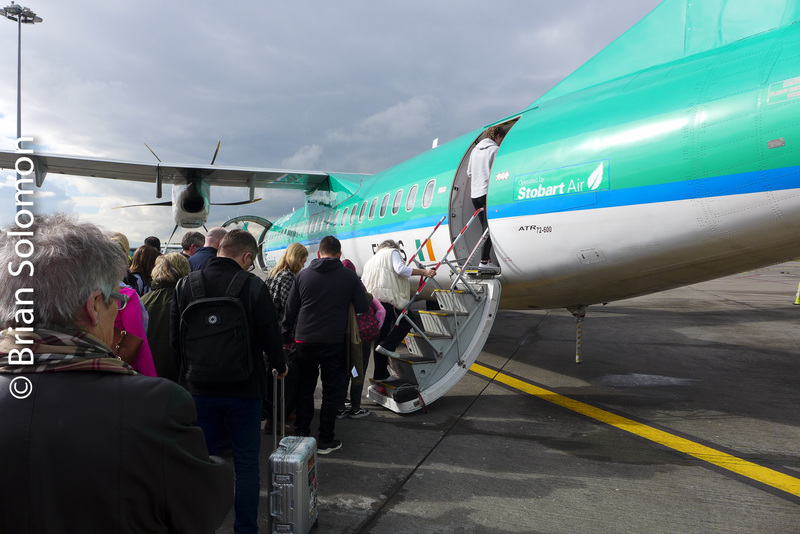 Then off to the airport to Dublin. 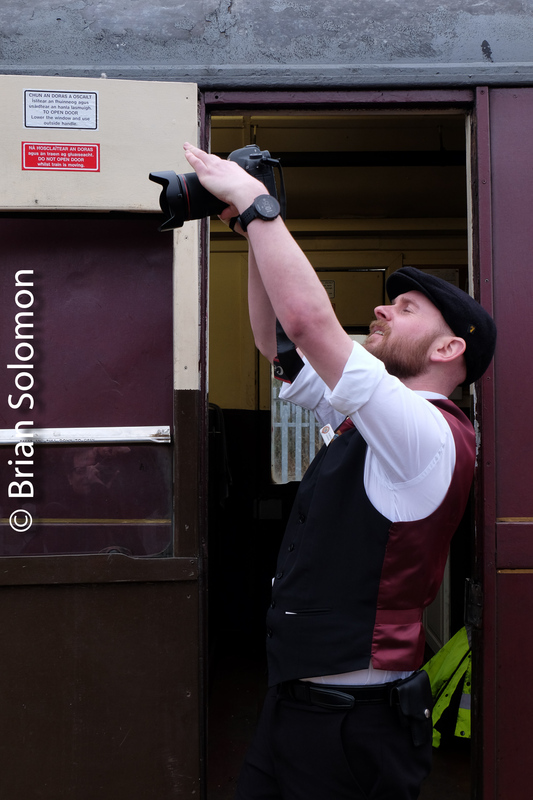 Easter Monday, photographer Jay Monaghan and I were in position at Memorial Road in Dublin to catch the RPSI carriage transfer on its way from Connolly Station to Inchicore. 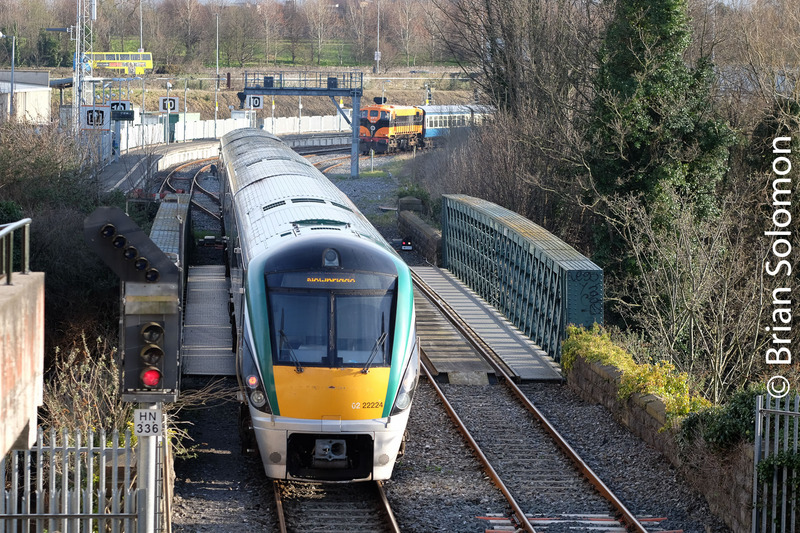 These were the same carriages featured in yesterday’s post, ‘Steam Crosses Dublin’s Loop Line’. Getting from Dubin’s city centre to Memorial Road, required a well-timed sprint to catch the 25B bus. 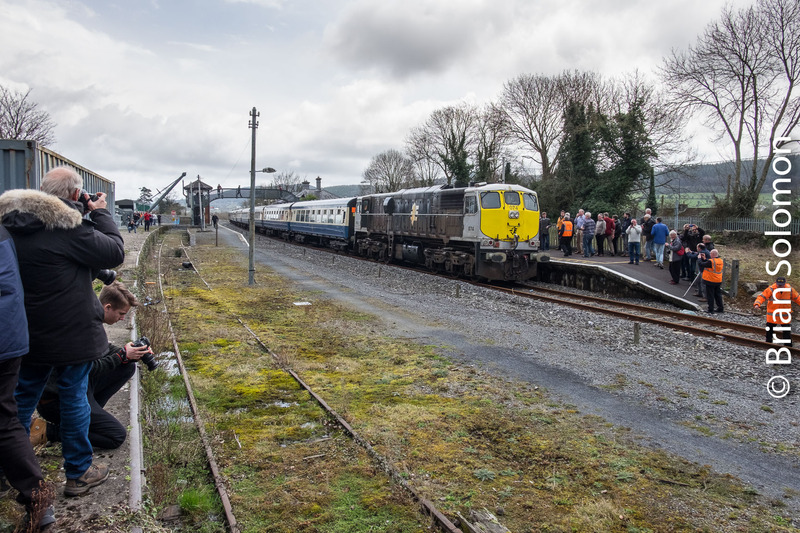 Although we were hoping for Irish Rail 073 in heritage paint, 201-class locomotive 232 in silver, green and yellow added colour to RPSI’s heritage train. 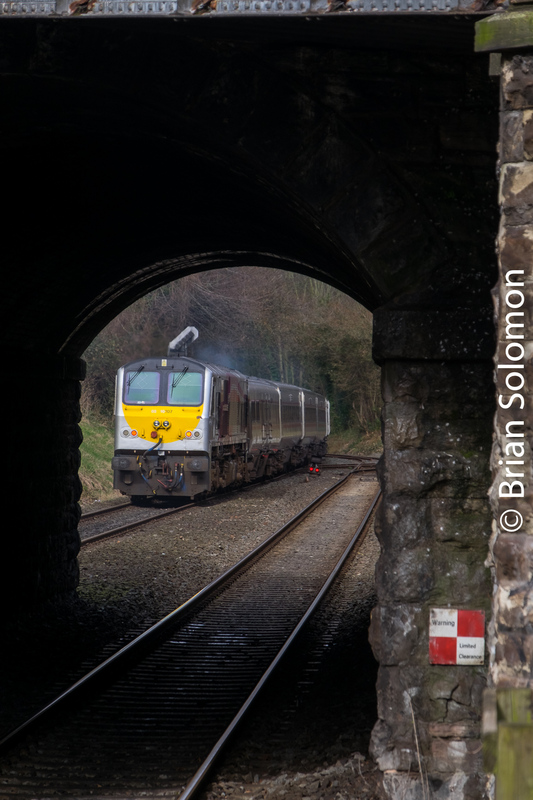 Irish Rail 232 leads RPSI’s Cravens up the gullet on Easter Monday. Exposed using a FujiFilm X-T1 digital camera. 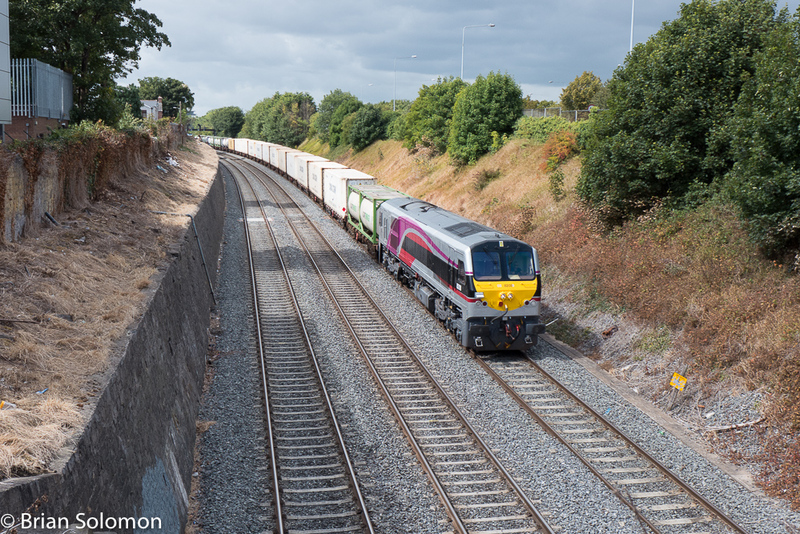 Tight telephoto trailing view of the RPSI train heading toward Inchicore Works. Although the train is slightly more distant, I prefer this training view because the trees to the left of the line aren’t cropped. 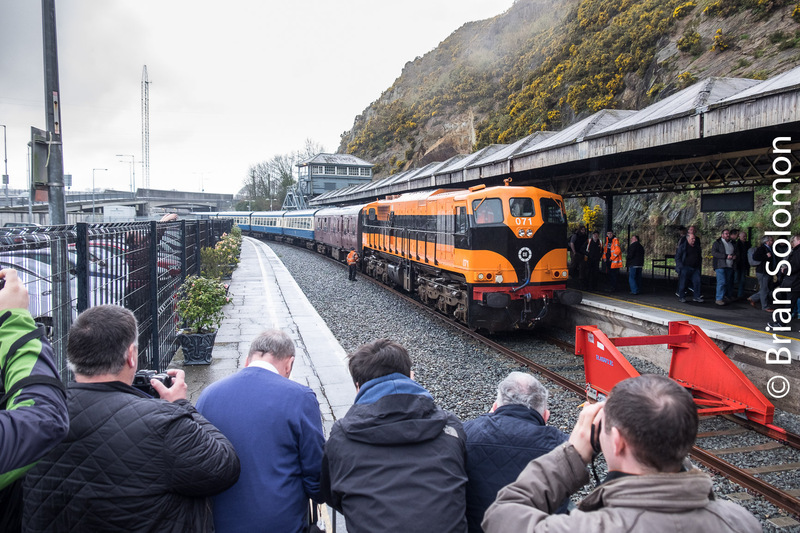 So, was this Ireland’s most colourful train on Easter Monday 2018? 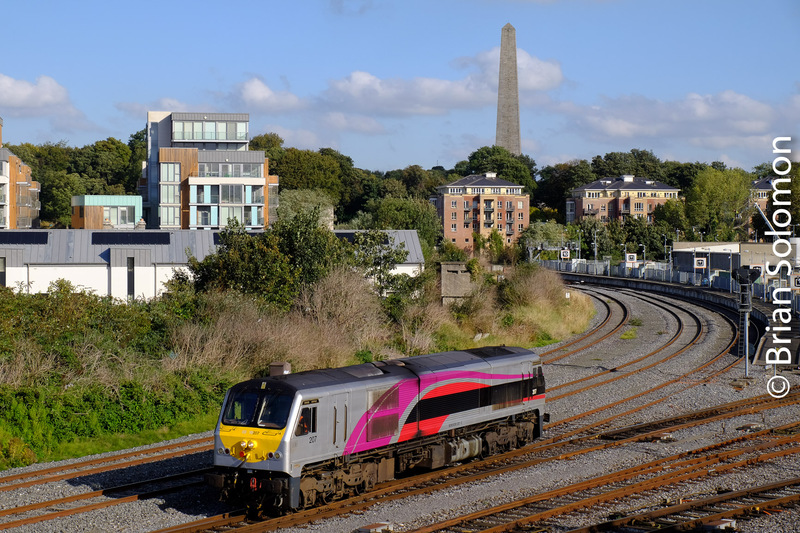 Steam Crosses Dublin’s Loop Line. 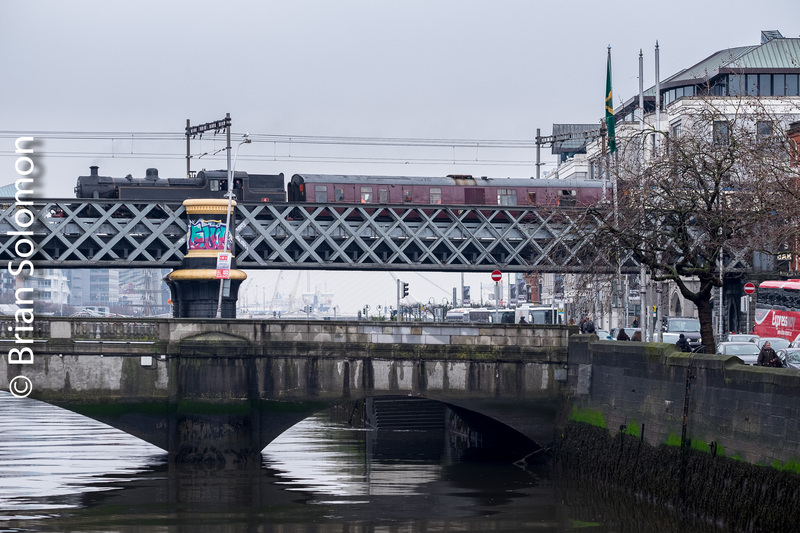 Dublin’s Loop Line is a difficult bridge to picture trains upon owing to a high degree of foreground and background clutter, complex lattice girder construction, and brightly coloured graffiti. Tank locomotive number 4 is an awkward mass and largely painted black that makes for a hard subject to picture satisfactorily, even on a good bright day. It wasn’t a bright day; the lighting conditions were flat (low contrast) and bland. Further complicating matters, there wasn’t more than a few seconds warning before the train entered the scene, so I needed to be poised. Friends on board assisted my timing by keeping me up to date as to the location of the train. I made my views from the Rosie Hackett Bridge (opened in 2014) looking down river toward Dublin Port. 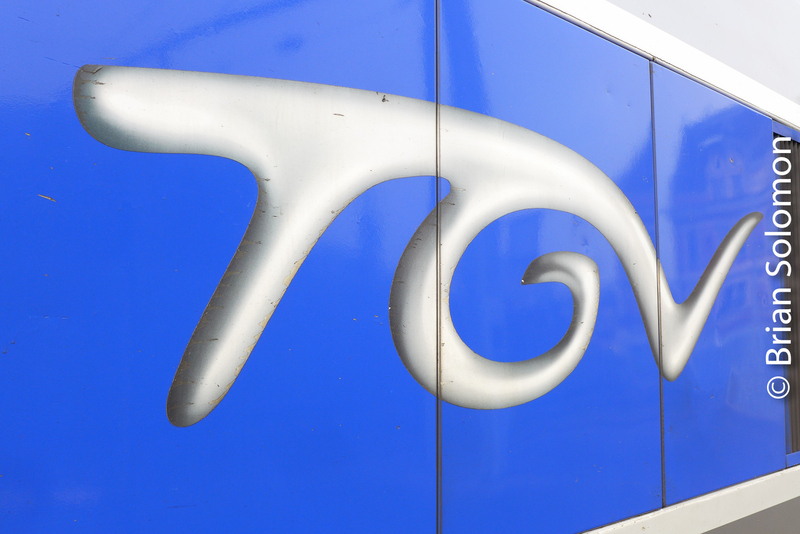 Rather than work with a zoom, I opted for my fixed focal length 90mm telephoto on my FujiFilm X-T1. 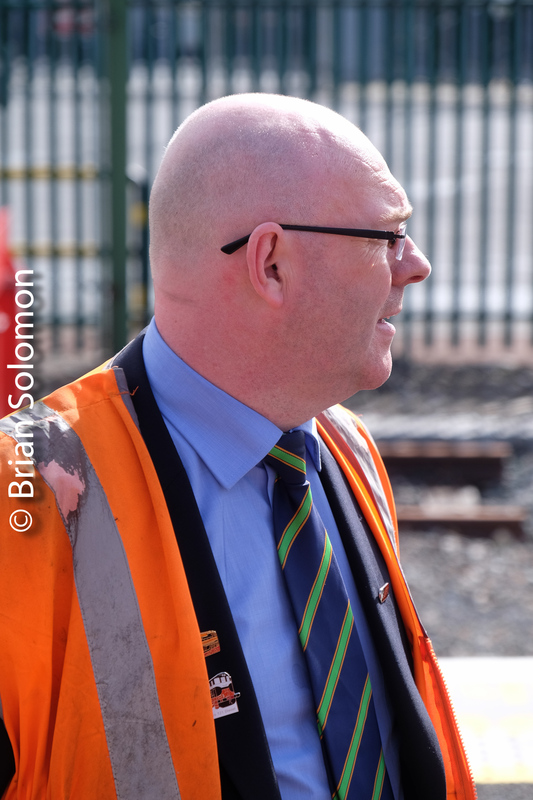 This gave me a wider aperture, allowed for shallow depth of field to help distinguish the train from its background, and is a very sharp lens corner to corner. DART electric suburban trains made for opportunities to make practice photos to test exposure, depth of field, focus and composition. As the train clattered across the bridge I made several exposures, trying to minimize the distractions of bridge infrastructure and background clutter. My first view of RPSI No. 4 on the bridge. 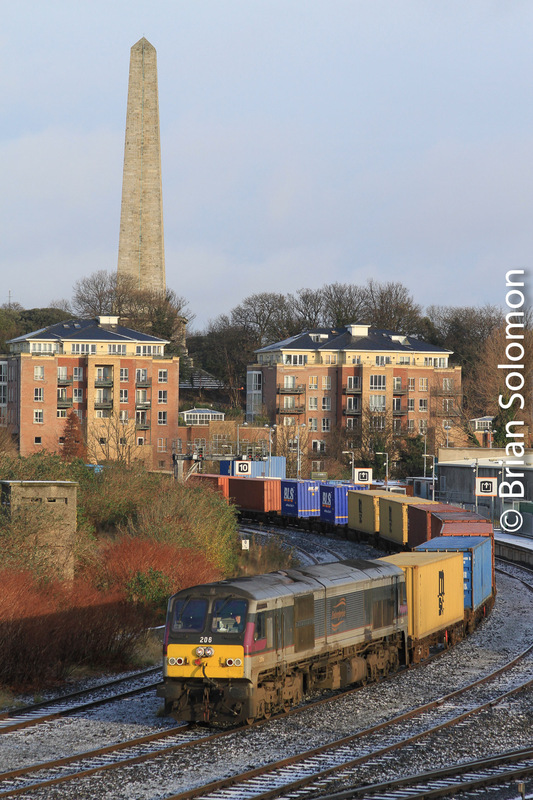 This subtly shows Dublin port in the distance and features traffic on the south quays. This is probably the best of my efforts. I adjust the contrast locally to help emphasize the smoke from the engine. I suppose that’s cheating in some eyes, but all I did was enhance the smoke to help show direction and that the engine was working and not static. How about this view of RPSI’s nice painted Cravens carriages? 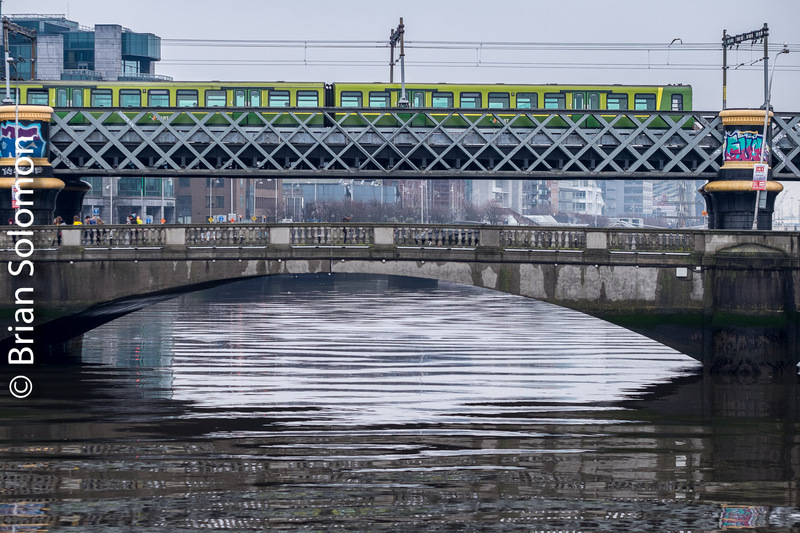 The rippled patters in the Liffey was an attraction of this angle. Although these are nice attempts, I’m not 100 percent satisfied, but without better light and an elevated view, I’m not sure how I could have made substantially better photos. Santa Fe in the Tehachapis: On This Day 25 Years Ago. 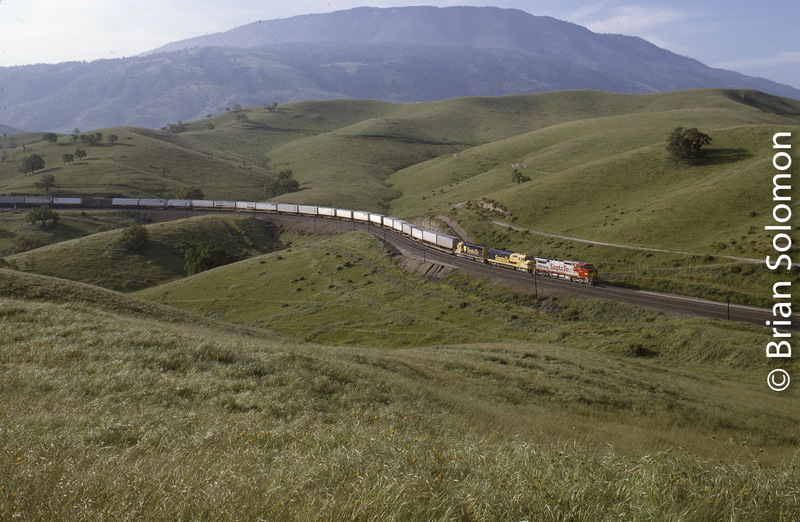 This was one of dozens of Kodachrome slides I exposed in California’s Tehachapi mountains on April 3, 1993—25 Years ago today. Fellow photographer Brian Jennison and I were on an epic excursion making images of Southern Pacific and Santa Fe trains. For this view I’m standing on a hillside near Tunnel 2 looking toward Bealville of a westward Santa Fe intermodal train. 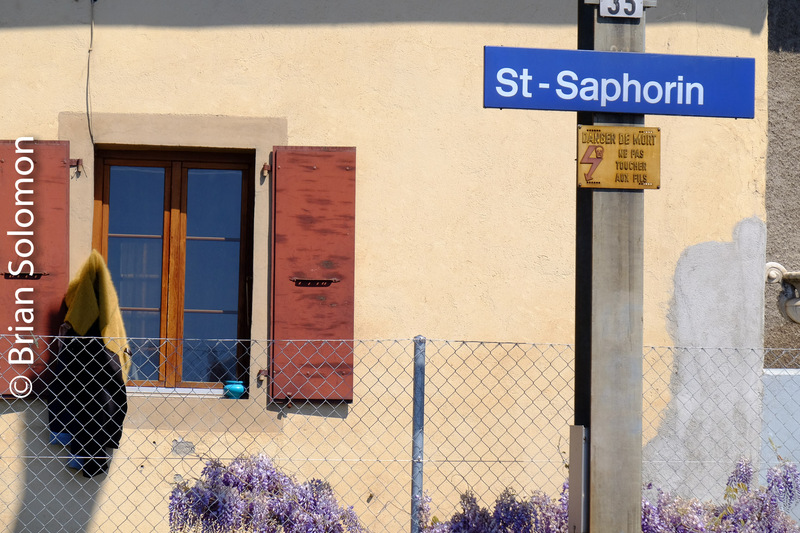 It was a beautiful Spring morning and the purple lupin flowers were in bloom. Exposed on Kodachrome 25 with a Nikon F3T fitted with a 35mm perspective control lens (with adjustable front element). 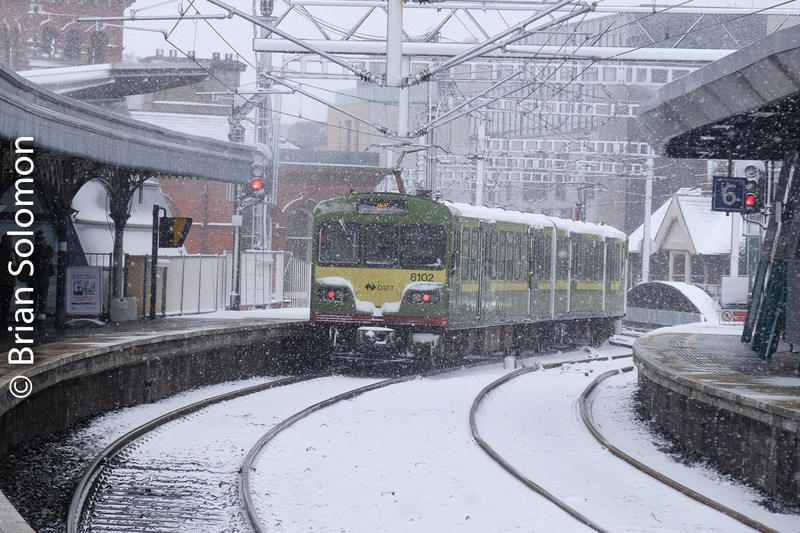 On the 18th of March, snow fell in Dublin, again. 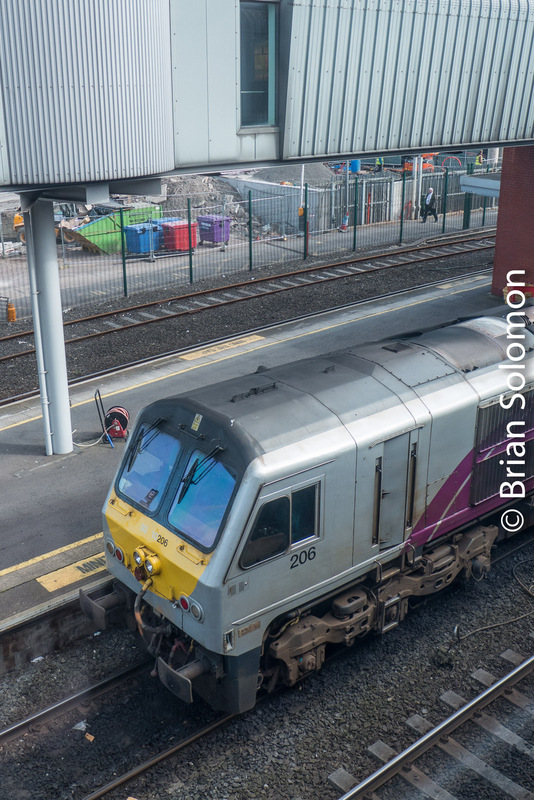 I made these views at Connolly Station of a southward DART suburban train using my FujiFilm XT1. The trick is not underexposing the snow. Falling snow can make for a great sense of depth. 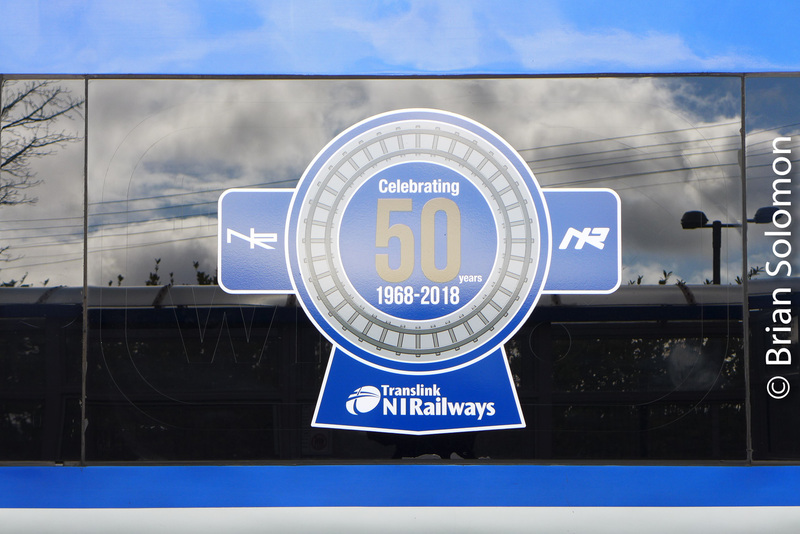 NI Railways marks 50 today! The other day, I made a few views of the celebration stickers and posters. 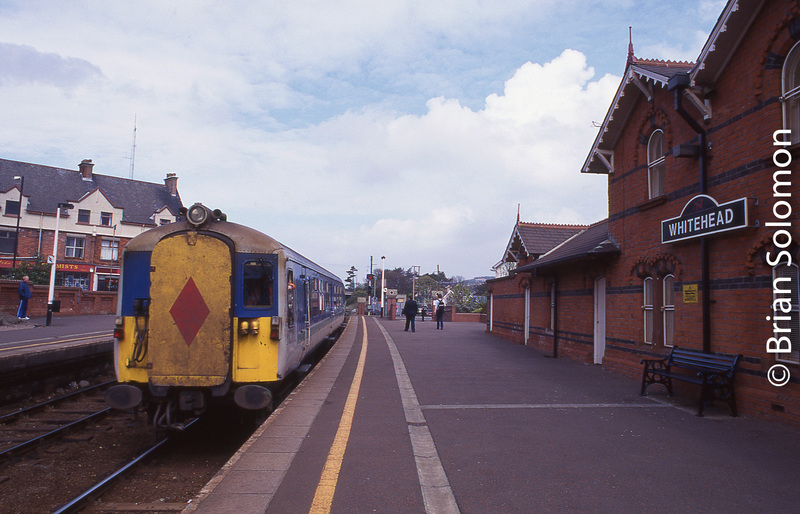 To help celebrate, I’m also posting a view I made of an old 80-class railcar at Whitehead back on 19 April 2000. 19 April 2000 at Whitehead. Fujichrome photo exposed with a Nikon.